After purchasing your kayak, it is important to know what other features may be valuable to your kayaking experience. We have compiled a list of 45 kayaking accessories which will make your kayaking trip even easier and more enjoyable. Below, we’ll introduce virtually all the types of kayak accessories you can buy. Kayak carts are one of the most useful accessories for kayak owners. They can be used to haul your kayaks between the coast and your vehicle. Check out our full review list on kayak carts to make sure you are purchasing the right one for you! 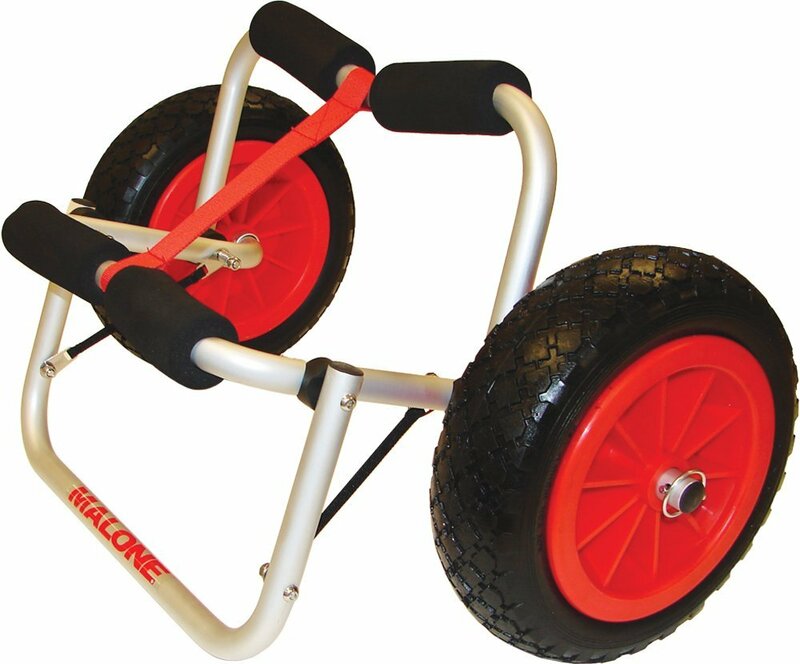 The Malone Auto Racks XPress Scupper Kayak Cart is built for all terrains but sand. This is an excellent feature, as there are many varying terrains around bodies of water. It can carry a load of up to 200 pounds. 200 pounds is enough weight to carry most kayaks and some of your equipment. 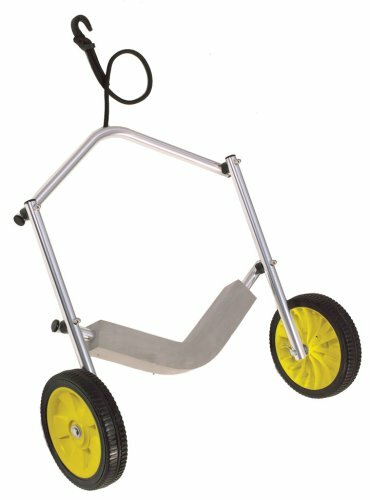 This cart also has an adjustable width feature, which makes it the best kayak cart on the market. It can be set for any width between 6 ½ inches to 16 ½ inches. Another kayak cart by Malone is the Nomad Standard. This cart varies from the Xpress Scupper in a few ways. First, it does well in all terrains, even sand. Second, its weight capacity is 150 pounds–this is not a very large weight limit, but still, most kayaks should fit well on this cart. The width on the cart is 24 inches, which is excellent. It also has quite a bit of padding and a limited lifetime warranty. If the cart itself is manufactured poorly, you will get a replacement. The Paddleboy Peanut Kayak Cart is a very small cart. It struggles quite a bit with terrains like sand and dirt. 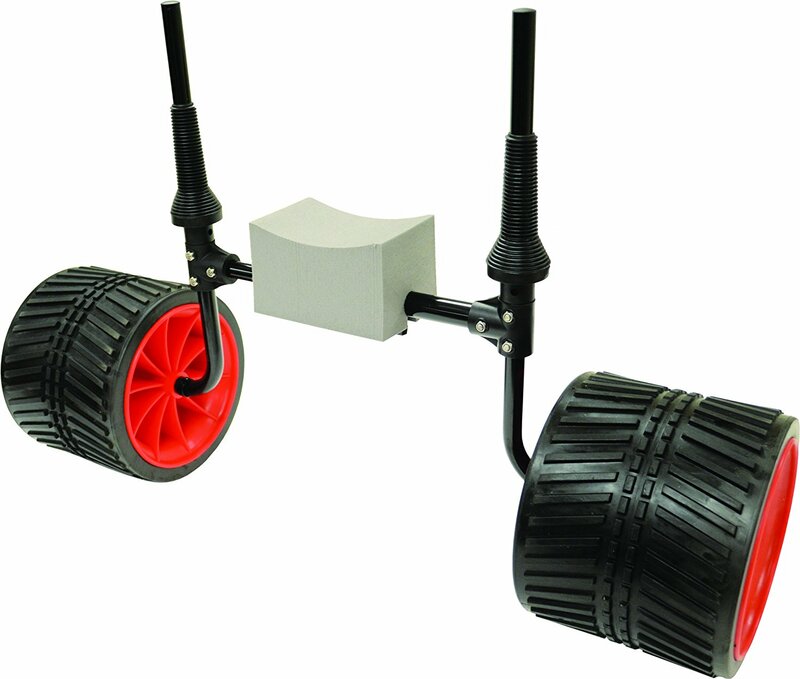 However, this cart has a width of 23 ¼ “ and can carry weight up to 150 pounds. The biggest benefit to this cart is that it can fold up extremely easily. This means it can fit inside your kayak’s storage compartment or slide under the seat of your car with ease. This is a must-buy among kayak accessories, as it will help you transport your kayak, yet not take up too much space in your car. Kayak roof racks are racks which hook onto the crossbars on top of your vehicle. These roof racks are designed to hold different kayaks and are also designed for different vehicle types. Read the full reviews on the top 5 kayak roof racks! 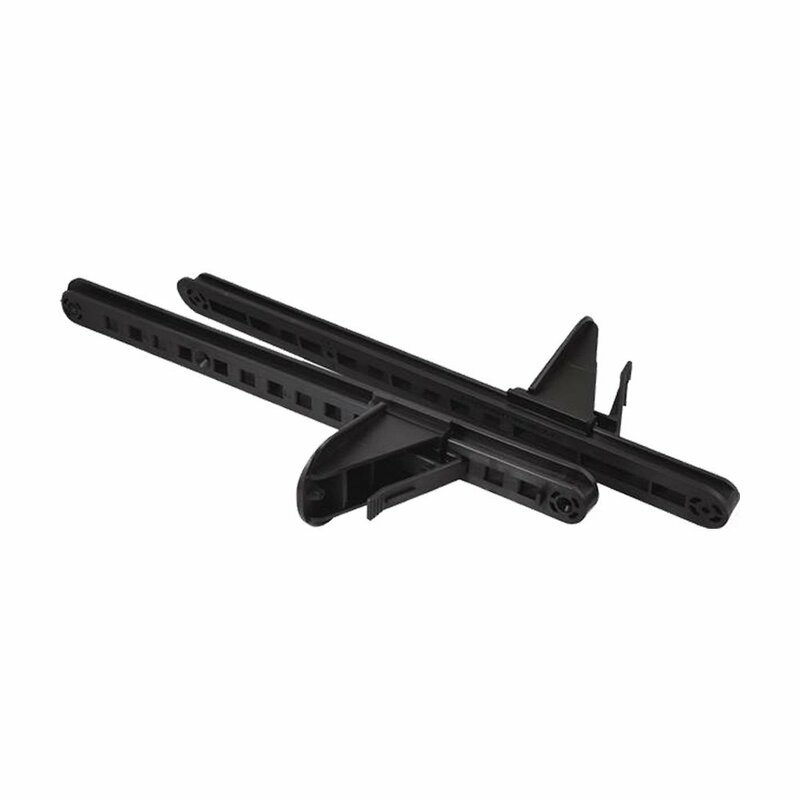 This kayak roof rack is a J-style rack, which means it is shaped like a J and the kayak rests in the cradle. This allows the kayak to sit on its side. The Malone Downloader is a universal car rack, so it fits with any car and for any kayak. It has a fold down technology which increases overhead clearance. It is really easy to install as well. 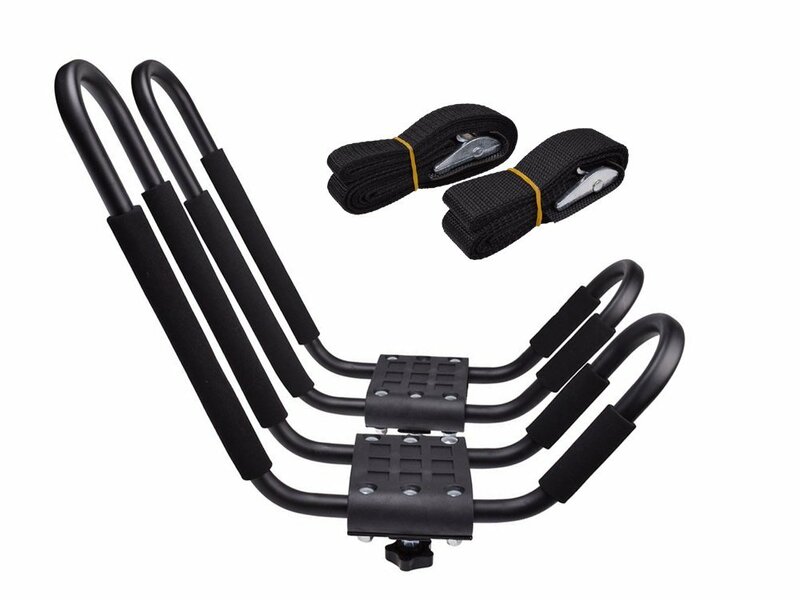 Another universal roof rack is the 2 pair Universal. As state in the name, however, this roof rack is actually a set of two roof rack holders. Make sure you read our full review and take note of which vehicles this carrier fits best with. There are some car mounts which simply do not fit well! Moreover, it is made with solid, heavy duty steel construction. 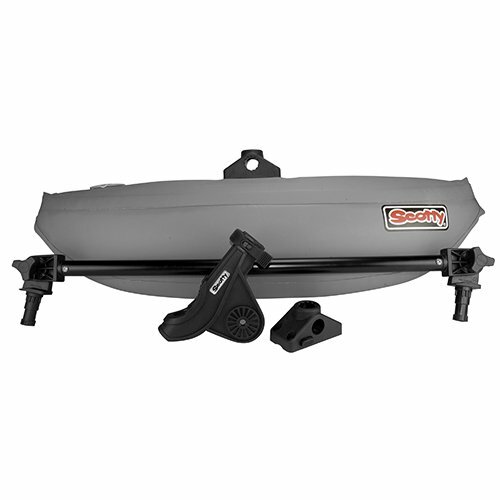 The surface has rust-resistant coating, so this kayak carrier will last you a long time. Kayak carriers come in two main types. THere are cradles and saddles. The cradles are often j-shaped and allow you to carry two kayaks on top of your vehicle. The saddles, however, only allow you to carry one kayak. This J-cradle is simply the best on the kayak roof rack market. 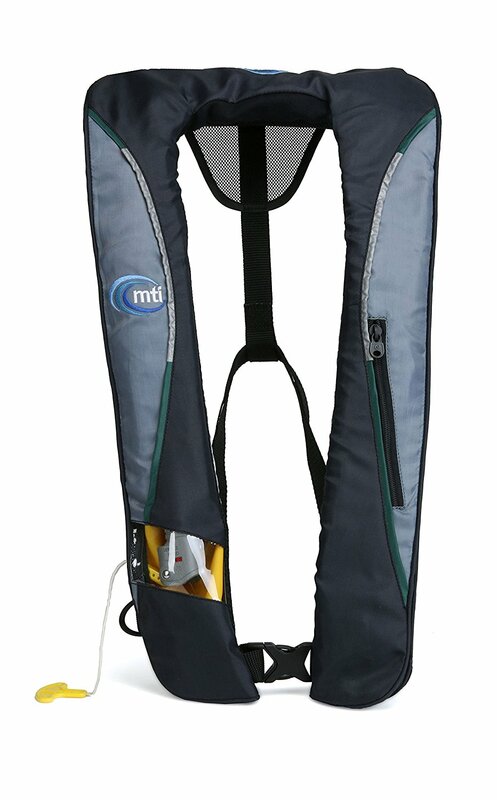 It uses minimum space, is easy to install, and it provides excellent straps for tying down your kayak. Additionally, this kayak roof rack has a very wide j-mouth, which allows the kayaker ease of loading and unloading. Finally, the Hull-a-Port by Thule is a very high rated kayak roof rack. It is not universal, fitting only some vehicles. Many cars need an adapted in order to use this roof rack. However, the Hull-a-Port allows for quick installation and removal. It also is very easy to mount your kayaks on these roof racks. 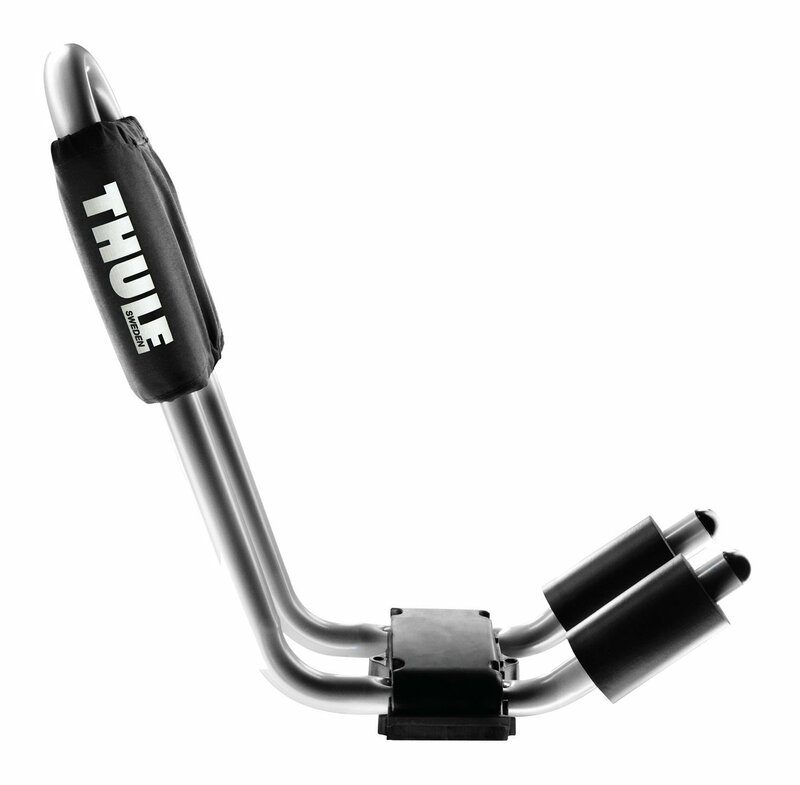 This is a favorite among kayak accessory enthusiasts, as Thule manufacturers only quality products. Once you’ve found the perfect kayak and gotten it out on the water, it can be shocking to find that you are sore in all of the wrong places. Sometimes buying a different kayak seat can combat that soreness. 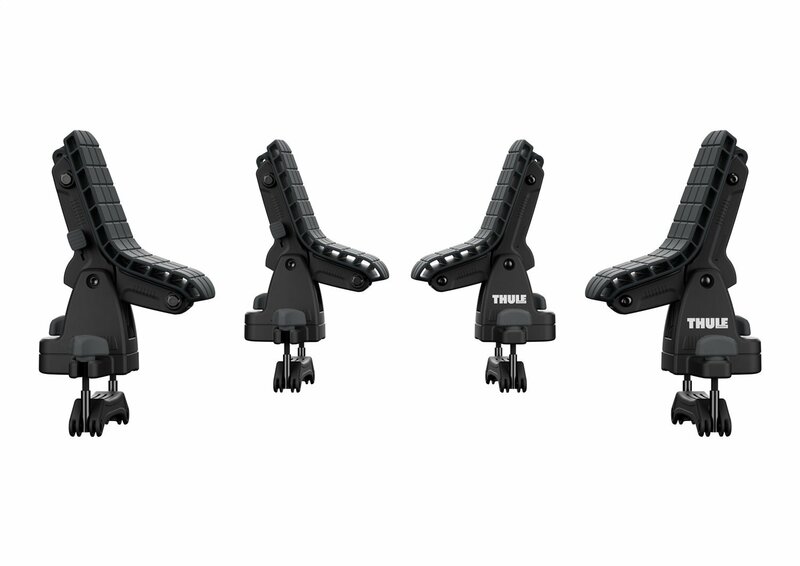 Below are the top three kayak seats, but if you’d like to read about the top 11 kayak seats on the market today, check out our full review. This seat is two inches thick and 18 inches wide. 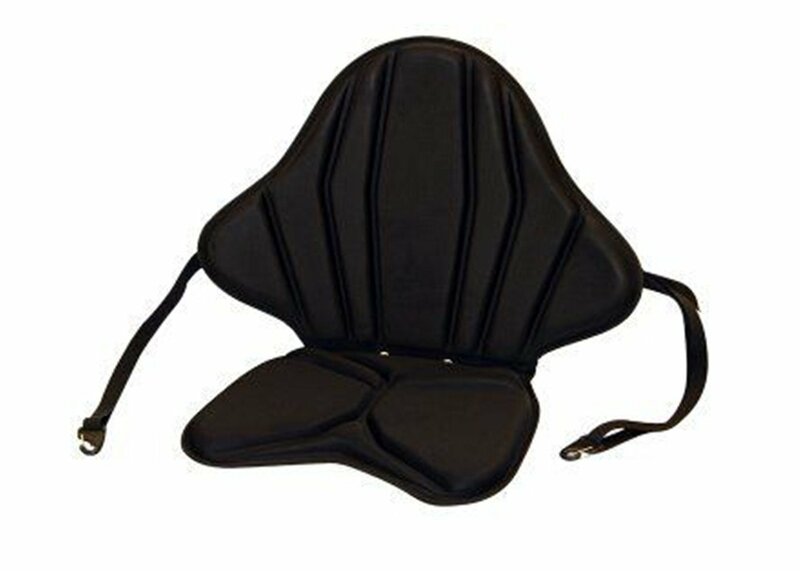 This means that kayakers of all sizes will have plenty of back support, as well as feel supported by two inches of foam. 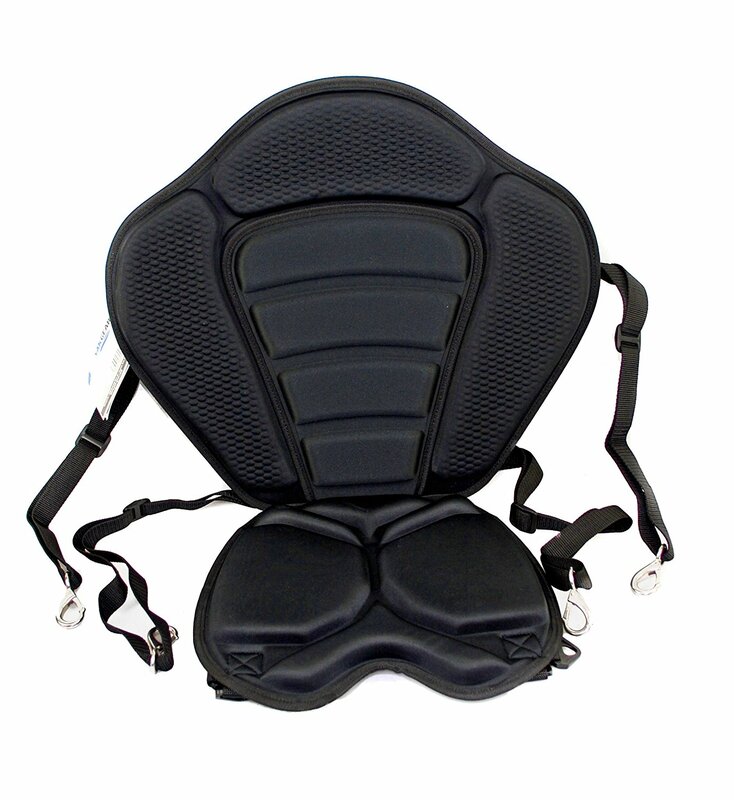 The Surf to Summit is also designed to give you lumbar support due to its thermoformed construction. A final feature of water draining channels makes this the perfect seat from kayaking. The Angler Spider may not be quite as comfortable as the Surf to Summit GTS, but it has lots of other storage features designed for fishermen. To begin with, there is a fishing rod holder built in. The seat also has D-rings for storing extra gear! 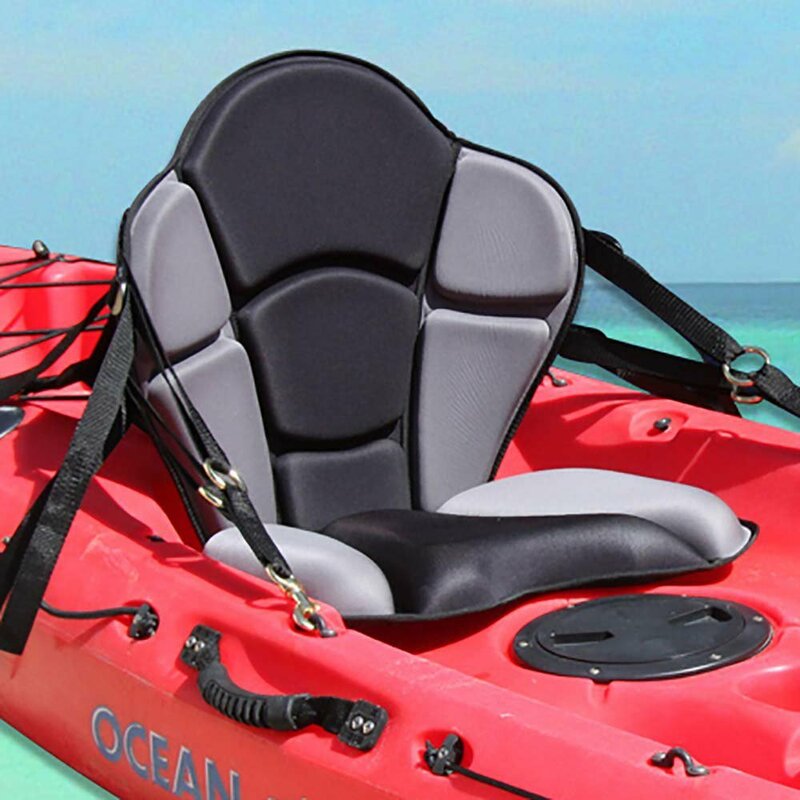 This seat is the best kayak seat for fishermen. The Manta Ray is very comparable to the Surf to Summit. At 19 inches tall, 15 inches wide, and 1 ½ inches deep, this seat provides maximum comfort. Additionally, it matches up with the Spider as it is equipped with D-rings for extra storage. 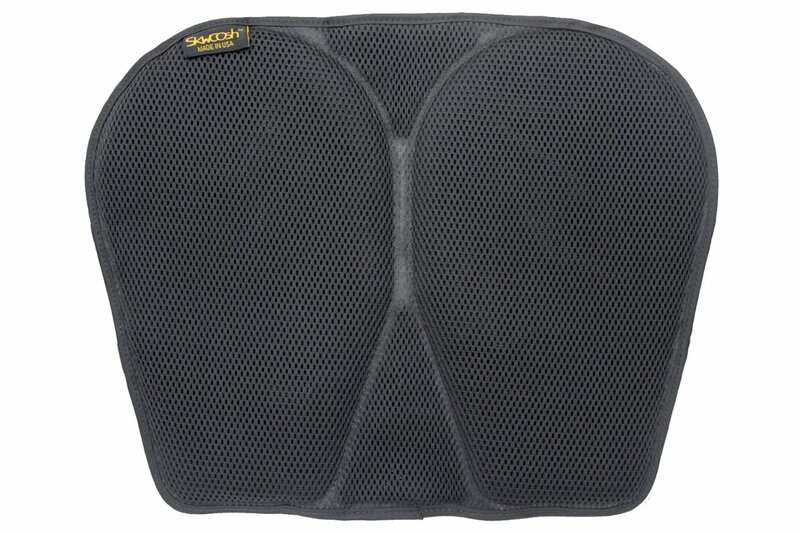 Kayak seat cushions are just the bottom part of a kayak seat, with no back rest or support. Some kayakers need to replace their cushion due to age or wearing, or if the kayak is a molded in seat and does not have a cushion to begin with. This seat cushion by Skwoosh is filled with gel. Contrasting with standard foam seating, the gel is far superior, as it allows a better fit for the kayaker. 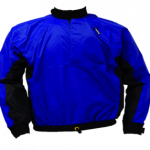 It also folds well for storage and is coated with mesh, allowing for maximum breathability. Some kayaks come with paddles standard for their style of kayak. However, as you begin to use your kayak more and more frequently, you may realize there is a better kayak paddle for your body type or kayaking preference. Our full list of the Top 5 Kayak Paddles provides an excellent explanation of which kayak paddles you should be using. The Seasense X-1 is a kayak paddle with an aluminum shaft and plastic blades. The aluminum shaft is typically not recommended, as it is heavier and it gets cold quickly. However, the Seasense comes with foam grippers. 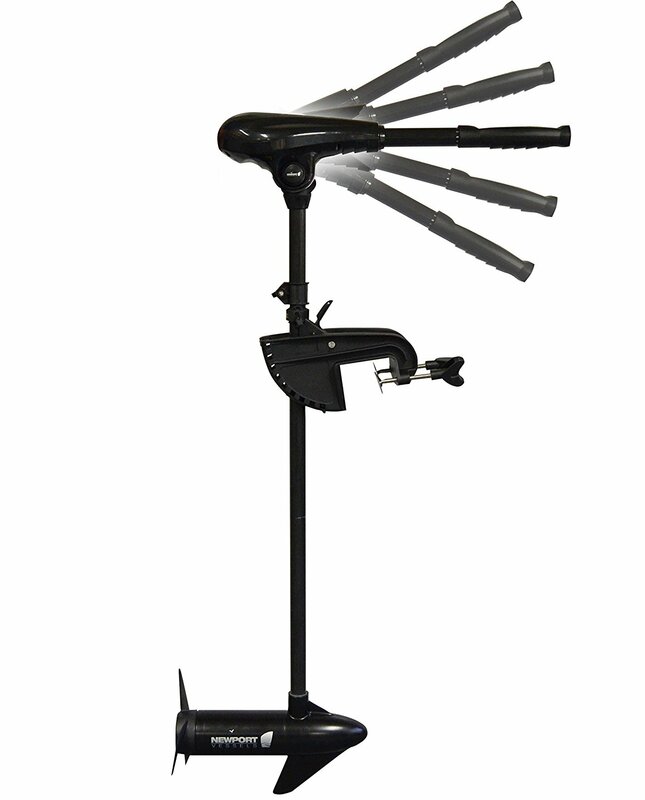 It also has variable blades–meaning you can change the direction of the blades to get different stroking techniques. The Bending Branches Angler Scout is a paddle designed for fishing kayakers. The main draw of this paddle is that it has a small hook on either end of the paddle. This is meant to catch your line to assist with removing it from obstacles or helping to bring in fish. The paddle is made from fiberglass blades, which are top of the line. THe shaft is aluminum, but as a trade off for having fiberglass blades is completely worth it. The Aquabound Sting Ray Kayak Paddle is all made from carbon. This is a decent material for kayaking paddles, and as you do not have a trade off with any aluminum, it makes for a really excellent paddle. It also has the option of feathering or changing the position of the paddles, which is a wonderful feature to have. As you can see, many kayaking paddle shafts are made from aluminum. These aluminum shafts take on the coldness of the water very quickly, so it can be beneficial to have paddle grips to prevent this from being an issue. 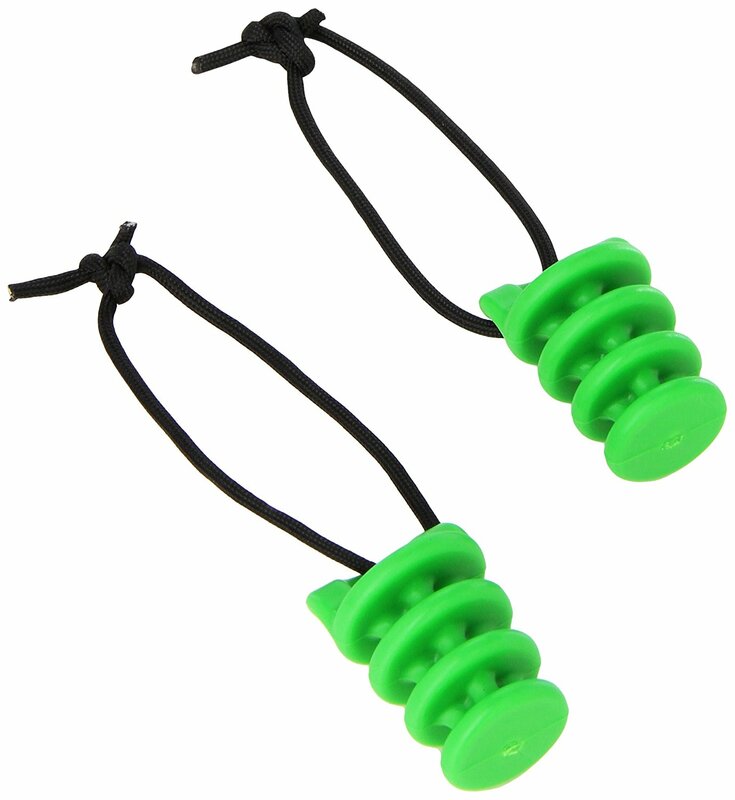 Paddle grips are also beneficial for kayakers who may have issues with their hands. 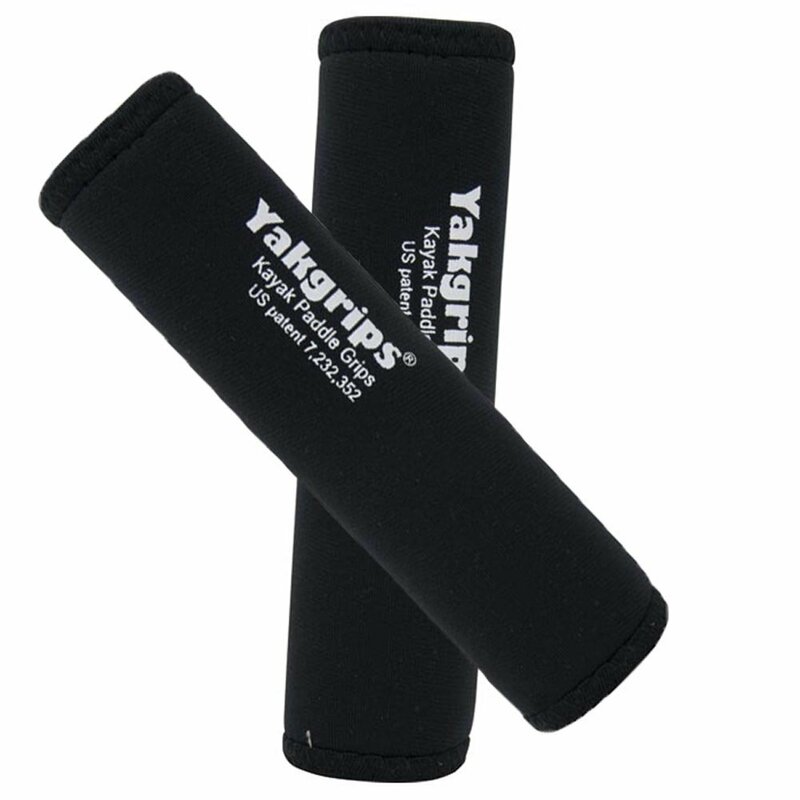 The Non-Slip Soft Kayak Velcro Close Paddle Grips provide excellent support for kayakers whose hands easily form blisters or have trouble gripping the paddle shaft. These grips are secured to your paddle via velcro, but are very easy to adjust! 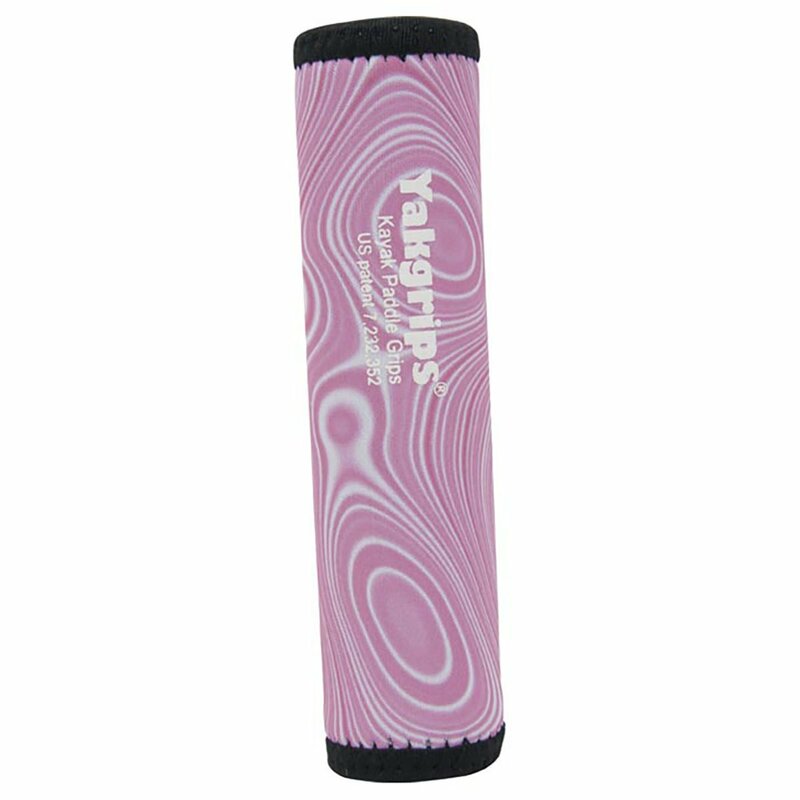 Yakgrips by Cascade Creek are simple to put on your kayak paddle–simply stretch them out and slide them on. These grips hold up extremely well over time and fit any paddle, making them easy to use. Do make sure your paddle is a two-piece paddle, as you cannot fit this paddle grip on a solid piece paddle. 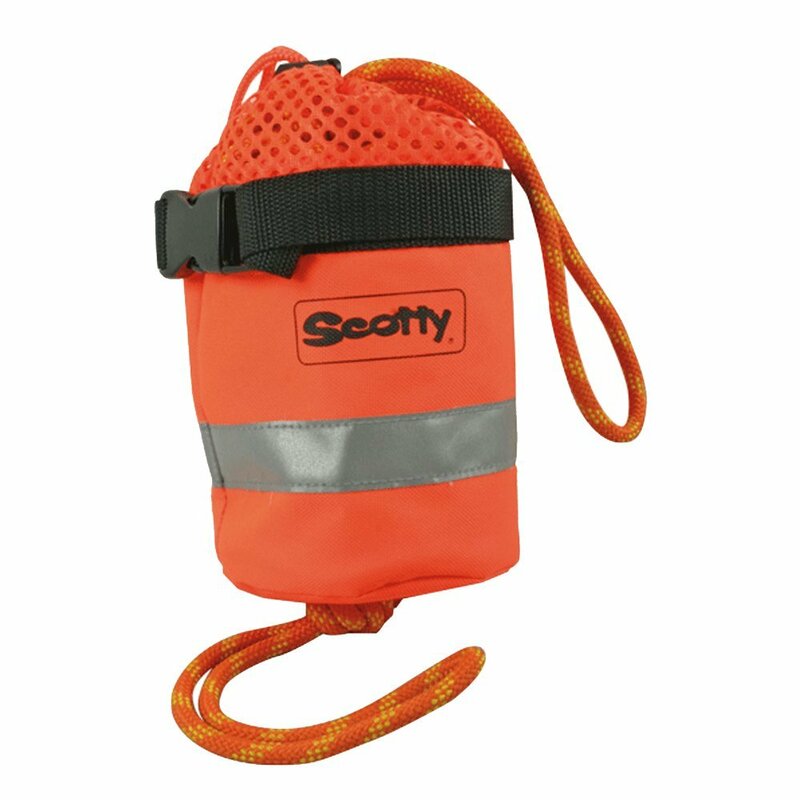 Life jackets, or PFD’s (Personal Flotation Devices) can literally save your life in a boating accident. This is why it is often the law that you have a PFD with you while kayaking. However, instead of a substandard life jacket which keeps you uncomfortable while boating, consider purchasing a top of the line life jacket with extra perks to keep you comfortable and safe! 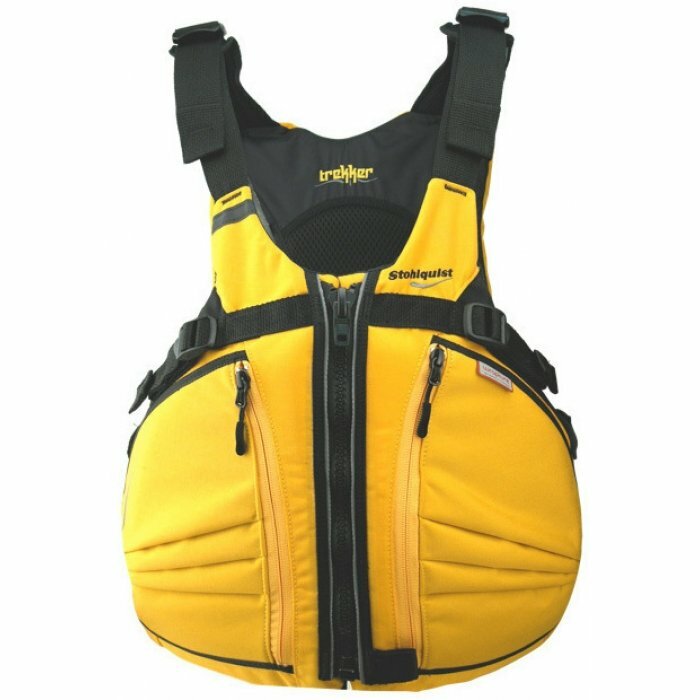 For further information, read our post on the 10 Best Life Jackets for Kayakers. The Stohlquist Men’s Trekker Life Jacket is an incredible little PFD. It has excellent structure to it, allowing it to mold perfectly to your body. It is primarily made of mesh, allowing for maximum breathability. Additionally, this PFD has several pockets and adjustable areas, allowing for complete customization. If this PFD could be summed up in one word, it would be: storage. D-rings, small pockets and large pockets deck this Angler’s Life Jacket out. But nothing on it makes it for fishermen-only. 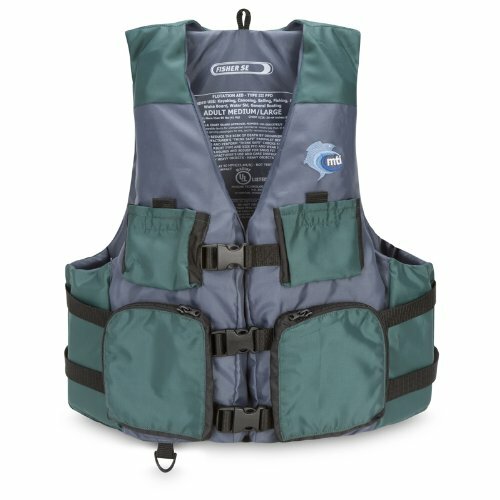 Anyone can enjoy the storage perks of this PFD. Many kayakers feel uncomfortable when considering an inflatable life jacket, but the Helios has two back up options for ensuring your safety in case of a boating accident. As far as storage is concerned, there is very little. However, the lightweight features of this kayak make it appealing to all kayakers. If you have found that river kayaking is your favorite activity to participate in on a kayak, a helmet is an absolute must. As you continue to river kayak, you will find yourself in more and more dangerous situations. However, there are many helmets which are lightweight and still provide a lot of protection to kayakers. This helmet is primarily made of foam. This foam keeps your head feeling comfortable, as the foam is airy and breathable. After you have been submerged, the foam drains extremely well. 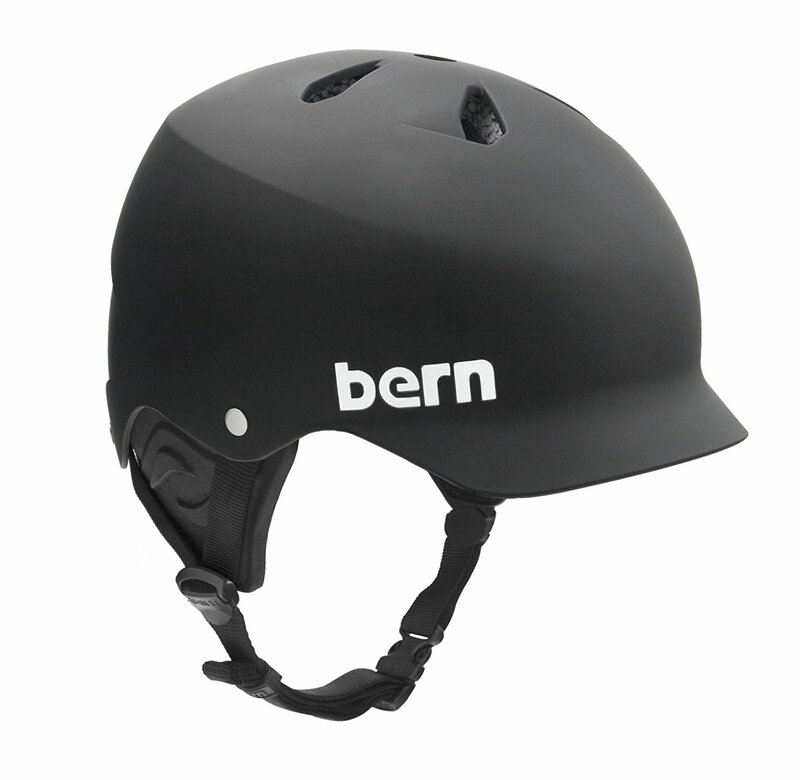 The Bern Watts Matte Water Helmet also complies with safety standards. The Triple Eight Water Halo Helmet has a rubber lining to prevent water from leaking into the helmet. It is extremely durable in terms of protecting your head when you hit the water hard or other obstacles. 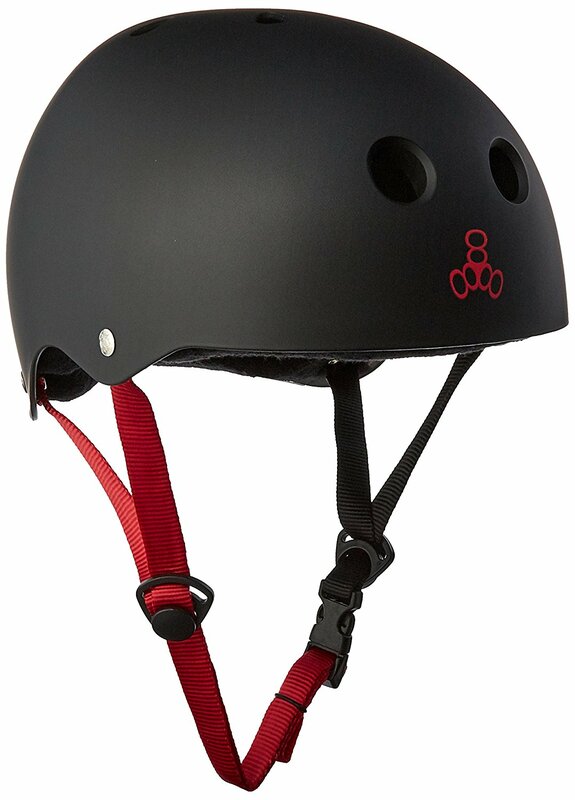 Additionally, it is easy to mount a GoPro or other devices on this helmet. When you spend all day out on the water, you need to bring food and drinks with you in order to stay hydrated. This may seem simple, but many kayaks have storage compartments which do not fit standard coolers. For a full list of the Top 10 Kayak Cooler Reviews, read our post! 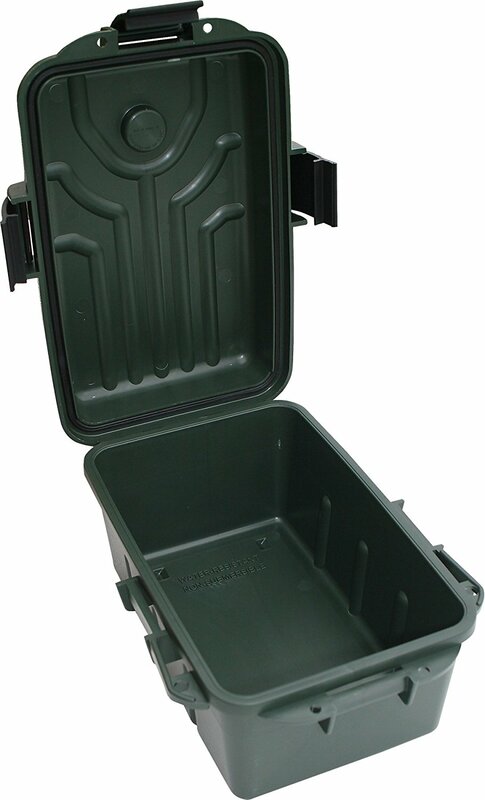 This softpak 40 is an excellent cooler for kayaking. The first reason is in the name–it is a soft pack cooler. Soft coolers can fit in many different shape storage compartments. 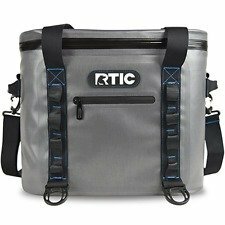 An anti-microbial liner is also in this cooler, helping to keep it clean and keep your food and drinks safe. The Orca Cooler is solid, but it has waterproof latches on it to keep your food and drinks safe, even if you tip. 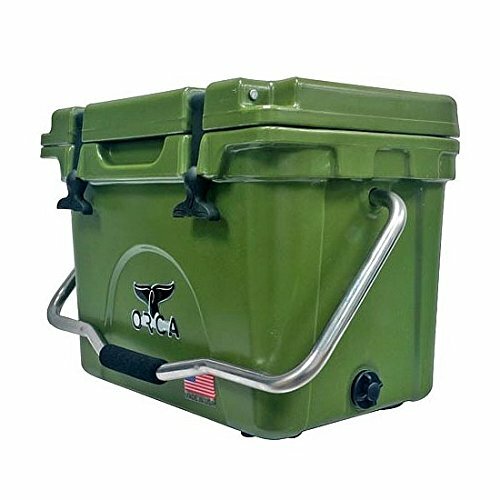 Additionally, this cooler has four built in bottle openers, so you can enjoy a cold one out on the water. 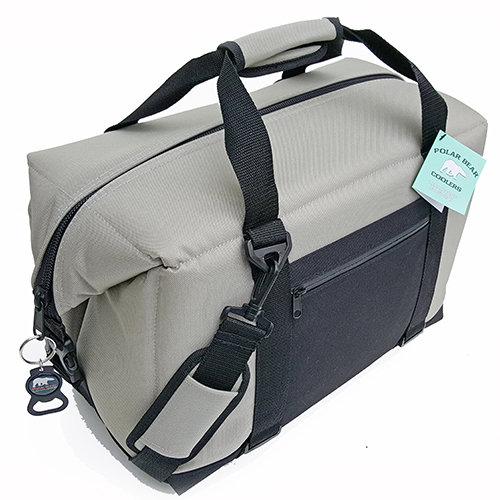 The Polar Bear 24 is another soft cooler. As with the SoftPak, this means it can fit in almost any storage compartment. Additionally, the Polar Bear 24 has an inch of waterproof insulation, which means that it can keep your ice cold for a long time. The listing reports it can keep ice solid for 2 whole days. For fishermen, trolling motors are absolutely crucial. When operated, they allow the kayak to move at a slow pace so that the fisherman can drag a line behind the boat. Fish are more attracted to the bait because the boat is moving at a consistent speed. This trolling motor has a total of 8 speeds, 5 forward and 3 in reverse. It also has 10 different positions you can lock it in and it has a comfortable handle. 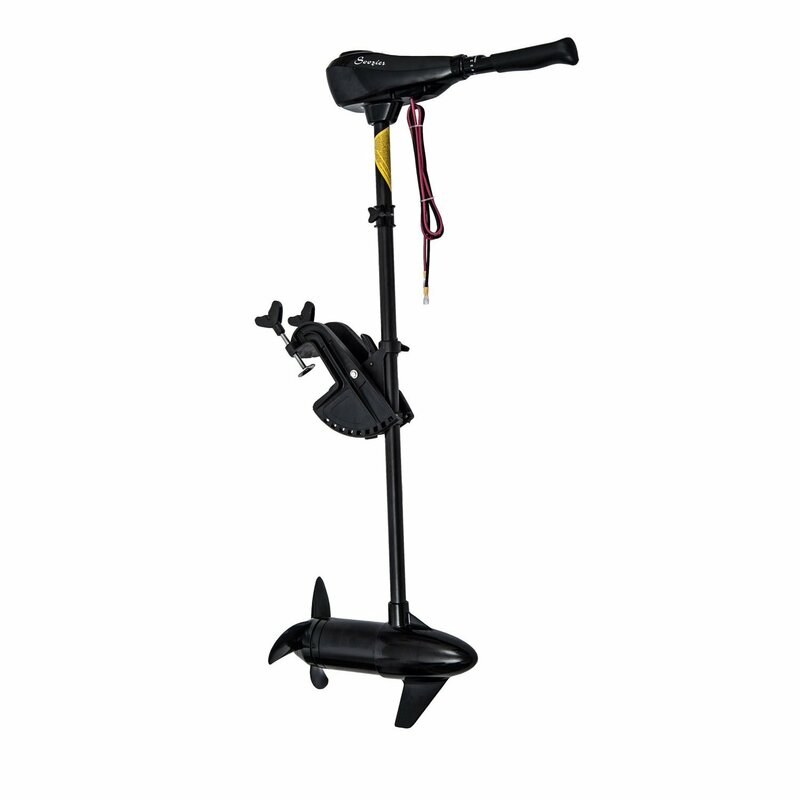 This motor is one of the best kayak trolling motors on the market, as it provides excellent trolling capabilities and yet provides versatility and comfort for the kayaker. The Vessels X-Series also has 8 speeds, but this trolling motor is designed specifically for the ocean, which is a major perk for many ocean-bound kayakers. The handle has 30 degrees of adjustment options and provides extreme comfort. To use a trolling motor on a kayak, you cannot just stick in it your storage area and call it good. You must have a special mounting system to use the motor. These systems must be fairly lightweight to allow you to stay afloat, but they also must be strong enough to hold the motor up. 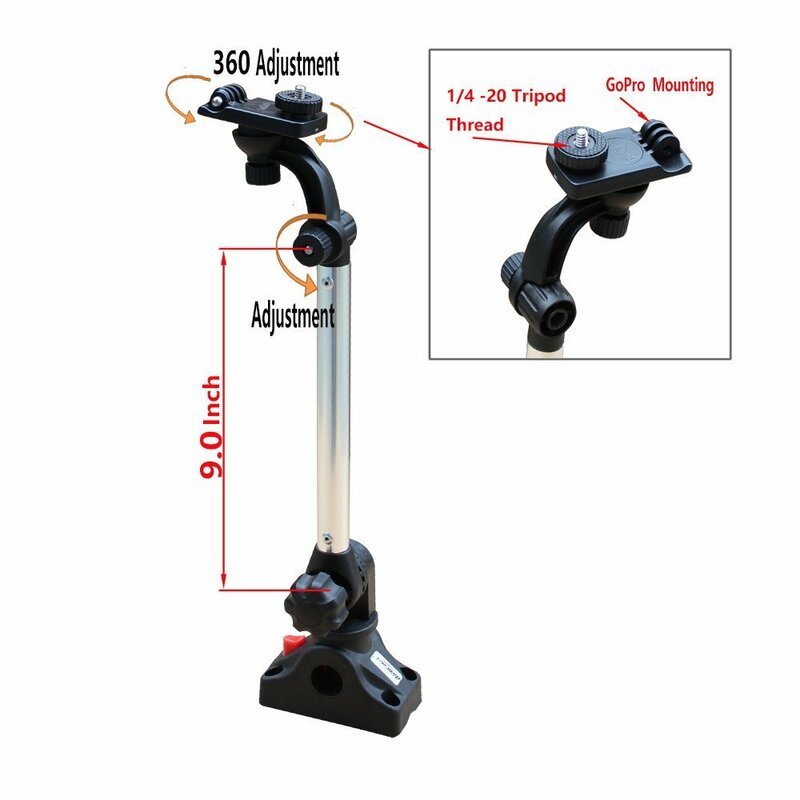 This Bullnose Rudder Clamp is a really unique Trolling Motor Mount, for example. Instead of just being a piece of equipment to use to mount your motor, it also functions as a rudder. This gives your yak better responsiveness on the water. Another item you must have in order to use your kayak trolling motor is the trolling motor battery. There are two main types of batteries: Starting and Deep Cycle. Starting batteries are designed specifically to start your motor. Deep Cycle batteries are designed to run your trolling motor for an extended period of time. To learn more about deep cycle and starting batteries and which are best for you, check out our review of the top 6 trolling motor batteries for kayaks. 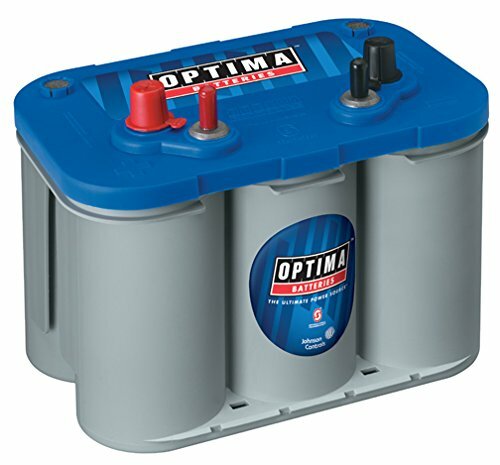 This Optima Battery is both a starting battery and a deep cycle battery. Keep in mind this is a fairly rare feature among batteries. Additionally, this battery is a spiral cell battery, which means if you are not using it, it will drain much more slowly. 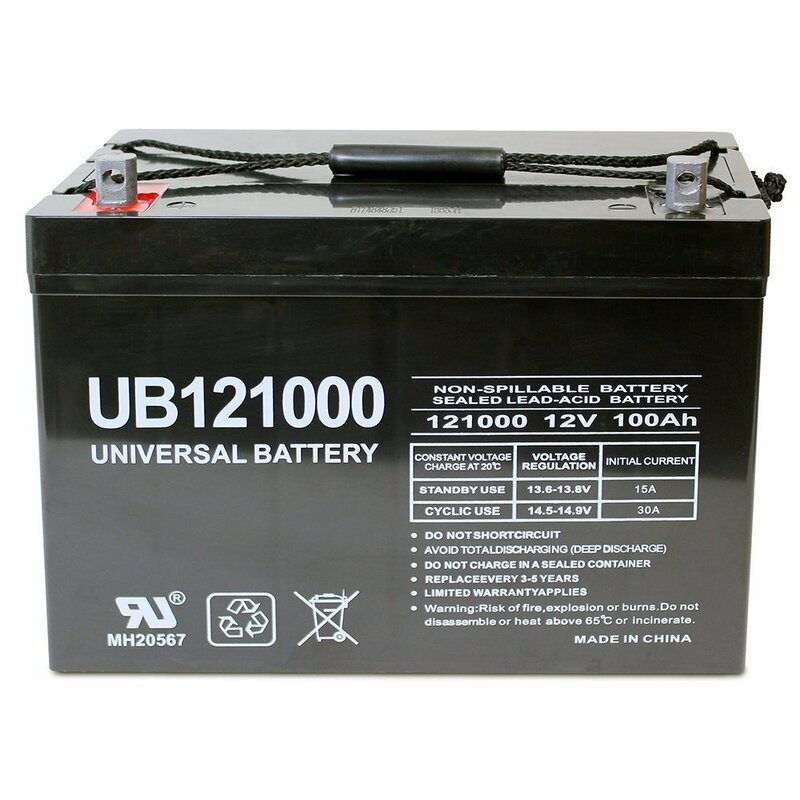 The Universal battery is only a Deep Cycle battery. It can be used to start the motor, but keep in mind, the battery will drain much more quickly. Another major perk of this battery is that it has a 1 year warranty. This allows any manufacturing flaws to be covered by the warranty. Using technology can really advance one’s fishing experience. 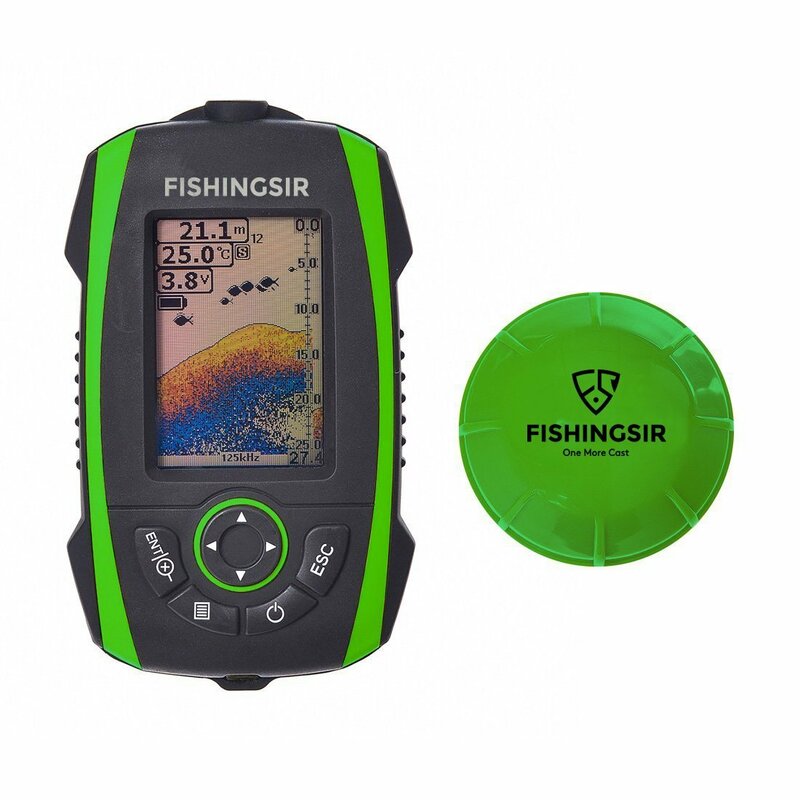 By purchasing a fish finder, you are guaranteed to know exactly where the fish are on your body of water. However, you must purchase a fish finder designed for kayak use, or the fish finder will not always work appropriately. For reviews on the Top 9 Kayak Fish Finders, read our post! The Lowrance Hook 7X Sonar Fish Finder has a CHIRP sonar system, meaning it sends out lots of sonar signals. It then combines those signal returns to give you a clear image. Another perk with this small fish finder is that it has TrackBack. In other words, it records the sonar shifts, so you can play back exactly where the fish are heading. 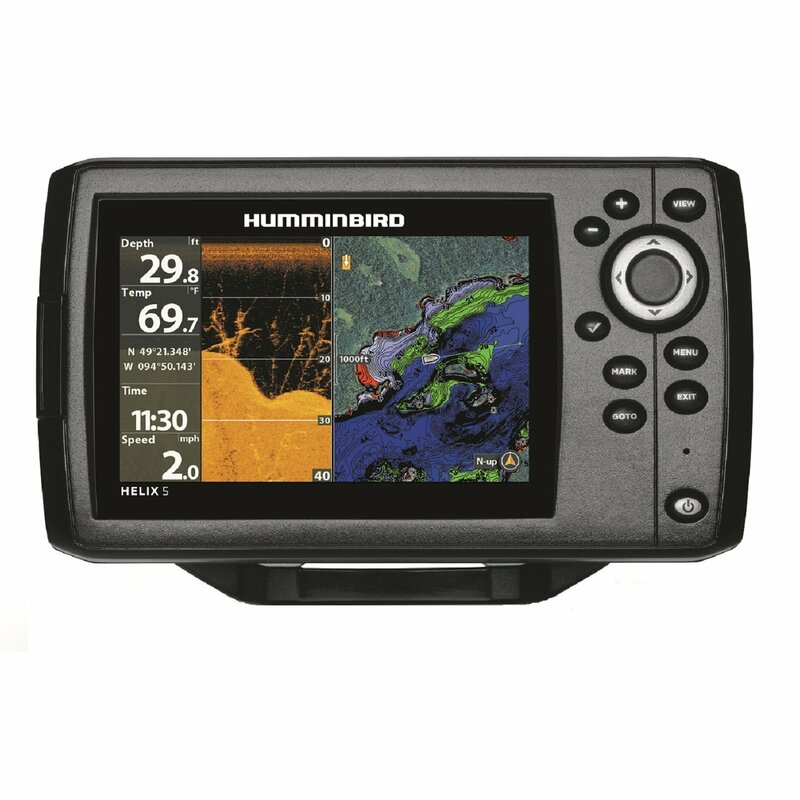 The Humminbird Helix 5 is another CHIRP fish finder. It also has GPS built into it. This limits your need for a GPS and gives you a more accurate reading of where the fish are. In order to use a fish finder, however, you have to be able to mount it in your kayak. Some fish finders come with mounts, but most do not. 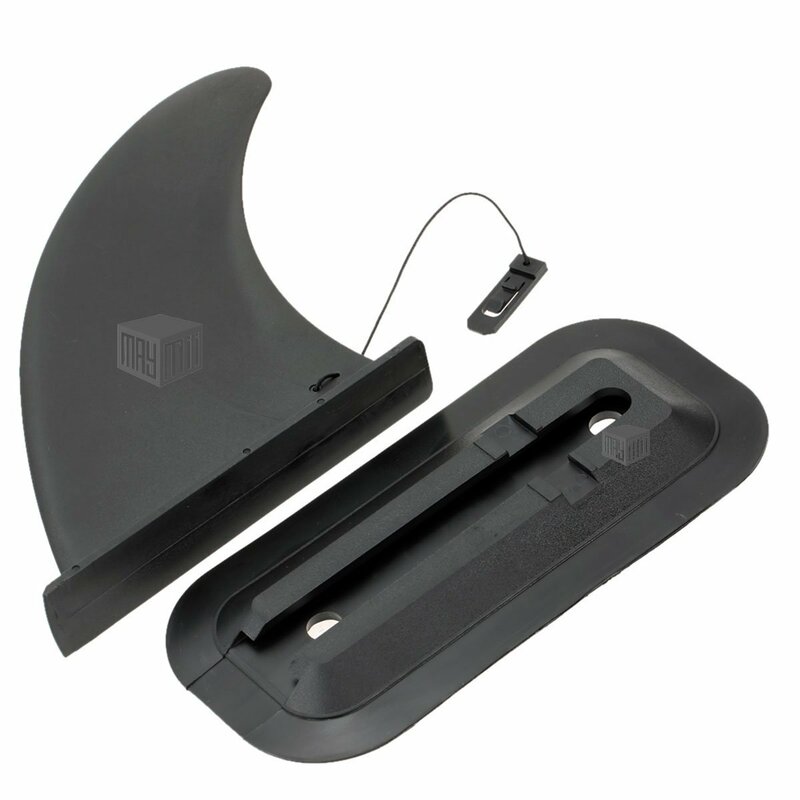 It is important to choose a mount which fits your fish finder and is compatible with your kayak. 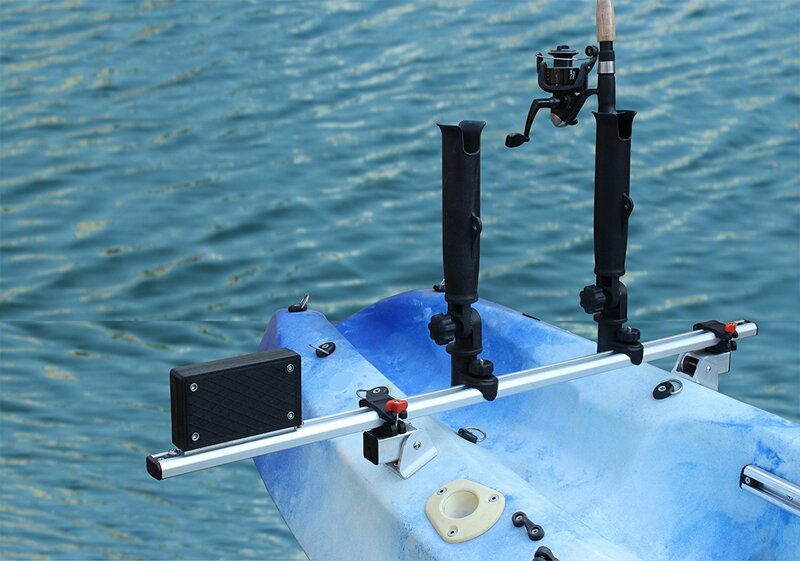 This arm mount is one of the best fish finder mounts for kayaks on the market. 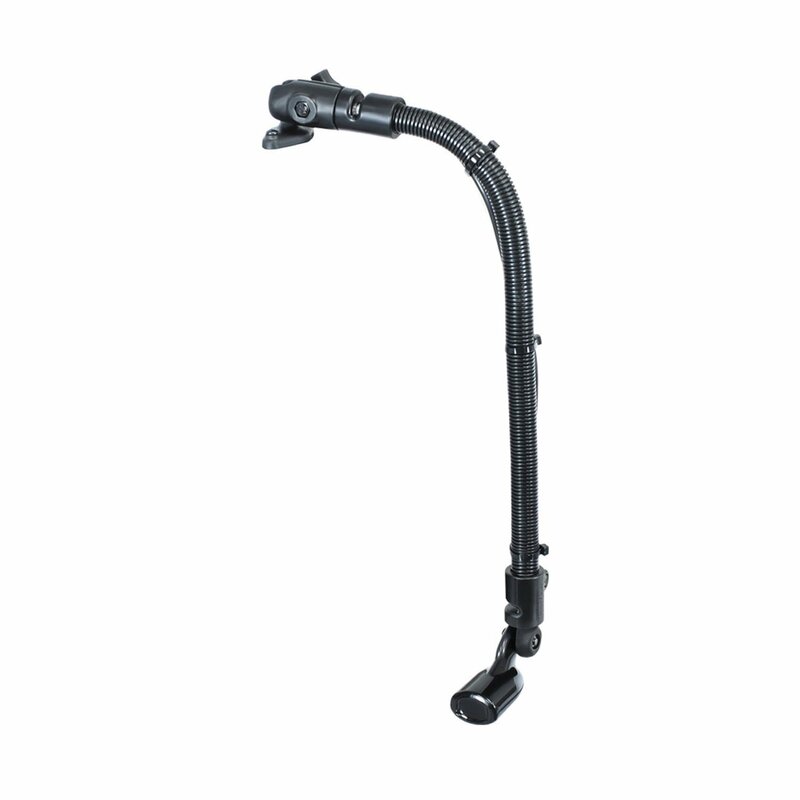 The arm is easy on and easy off and you have multiple mounting options. You can screw the mount into your yak or mount it with a suction cup. Additionally, this arm mount swings over the cockpit of your kayak, allowing you to have it up close and personal. This is done so you can find your fish, or move it completely out of your way while you paddle. 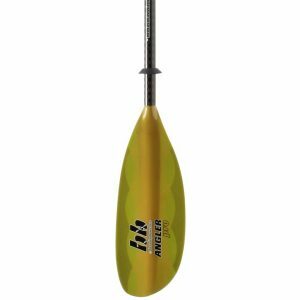 If your children kayak or you are a new kayaker–or you live somewhere where the waves are really intense–a kayak stabilizer might be the best kayak accessory you can have. 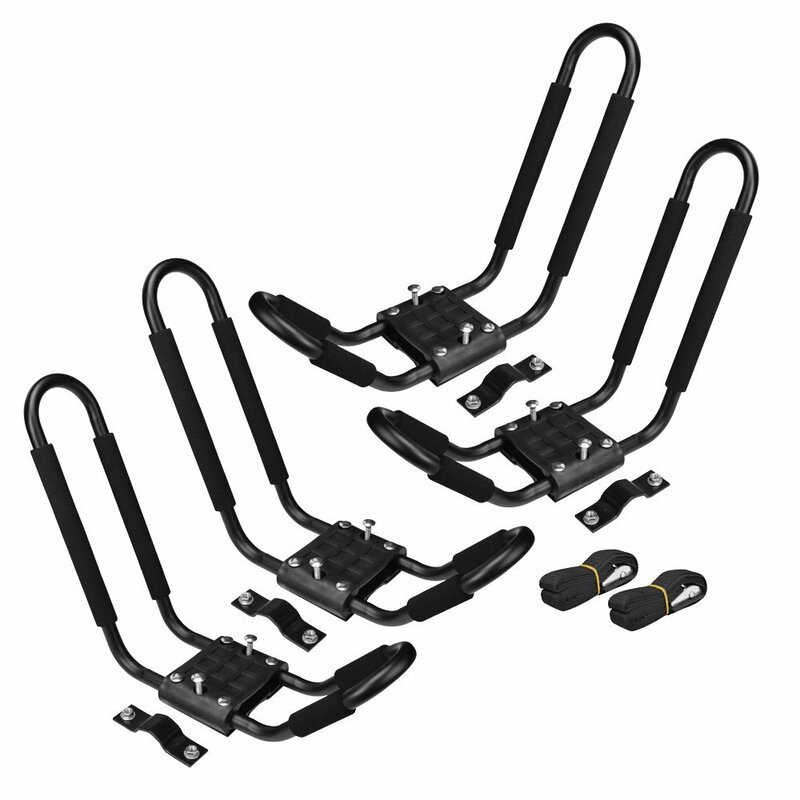 Kayak stabilizers provide extra stability for kayakers. These typically are in the form of some sort of foam piece which attaches to either side of the kayak. One of the best stabilizers on the market is the Airhead Training Wheels Set. 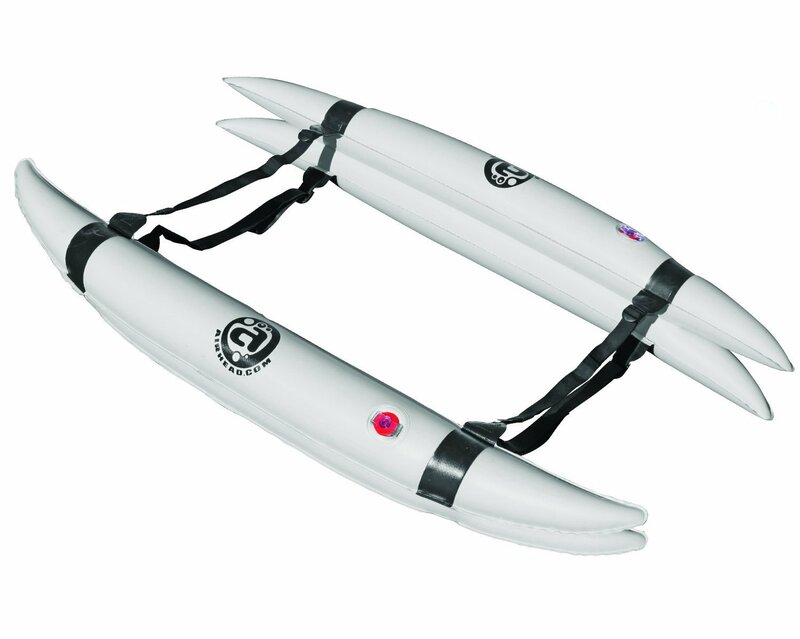 This set is built with speed in mind–one of the top complaints about stabilizers is that they slow down the kayak. However, Airhead has made sure this stabilizer provides balance which does not slow you down. It is also an inflatable set, meaning you can inflate and deflate as needed. No large extra gear for you! Finally, the company boasts that this is such a solid stabilizer you can actually do yoga on top of your kayak–an argument like that is hard to resist! The Scotty stabilizer system is also an inflatable stabilizer. It allows for 30 extra pounds of buoyancy. It also is an adjustable system. The adjustability of this system means that it is easy to install and uninstall. You do not have to drill holes to install this system either, which is a major perk for most kayak owners. Every kayaker needs a cup holder at some point. However, some of the best cup holders are ones that you add onto your kayak, not cup holders which come built in. This is because often the kayak cup holders are one-size only. The cup holder you purchase can fit many different sized beverages. The Can-Panion Cup Holder is a plastic cup holder. This plastic is fairly flexible, to allow cups of different sizes to fit easily. There have been some reports of this flexibility cause the cup to fall out, but this is not true of all experiences. Different from the Can-Panion, this cup holder is solid plastic. It also holds two cups or fishing poles. This can be a major incentive for kayakers, as it provides quite a bit of customization options. 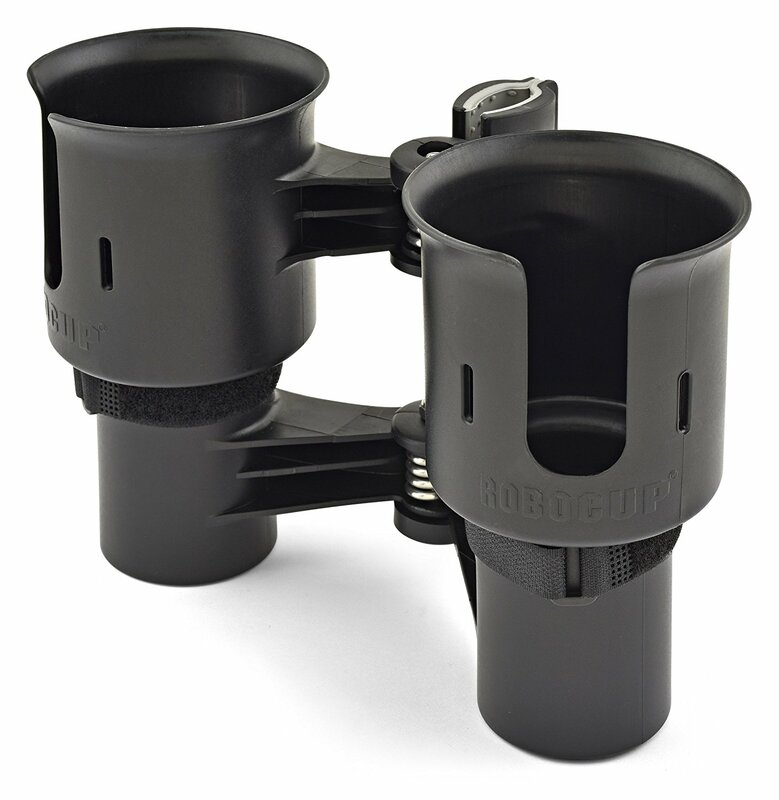 Additionally, this cup holder is adjustable, which means the size of the cup holder can change to fit different size drinks or fishing rods–even down to the size of drumsticks. Another kayak feature for your trolling motor or motor addition is a battery box. Battery boxes are extremely important because they allow you to keep your battery 100% waterproof. 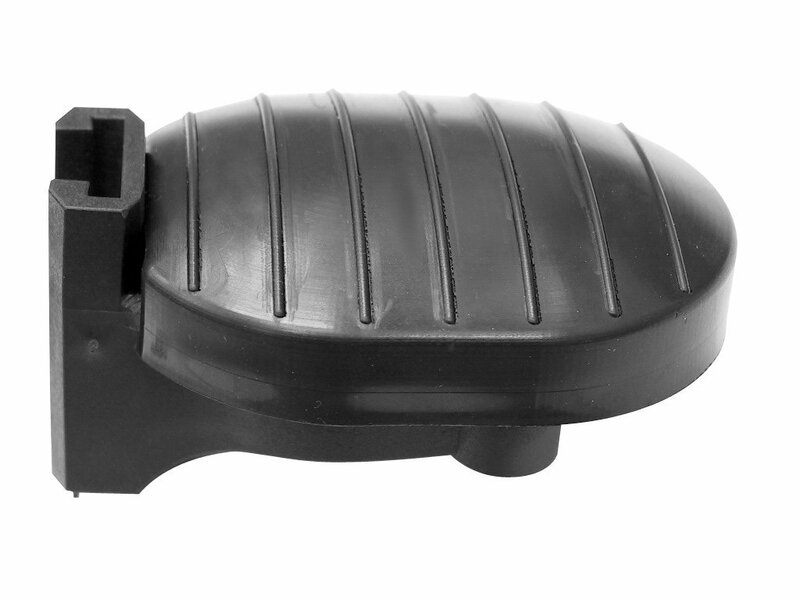 Battery boxes are a container which your motor battery can fit inside. The best kayak battery boxes on the market keep your battery waterproof. 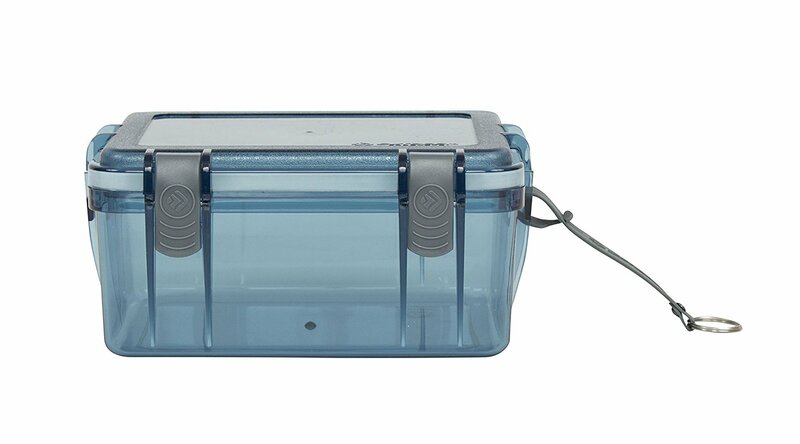 Outdoor Products’ Watertight Box is easily the best battery box on the market. It has a clip to attach it to your boat, so that if you do tip you won’t lose it. This battery box also has a seal on the inside edge which keeps it waterproof. Keep in mind though, this battery box is not designed to be fully submersed and kept that way. Though this is technically defines as a dry box, it is often used as a battery box. Sealed with a plastic o-ring, it allows you to keep the battery perfectly dry. This box has no clips, but is, instead, a very lightweight plastic. This plastic allows you to carry your battery, or other items, with ease. Bilge pumps are designed to literally pump water out of your kayak. Even if you have the best kayak and are the best kayaker, this is a smart investment for you. There are many different styles of bilge pumps, and you will want to take that under consideration, depending on the size of your kayak and your cockpit. 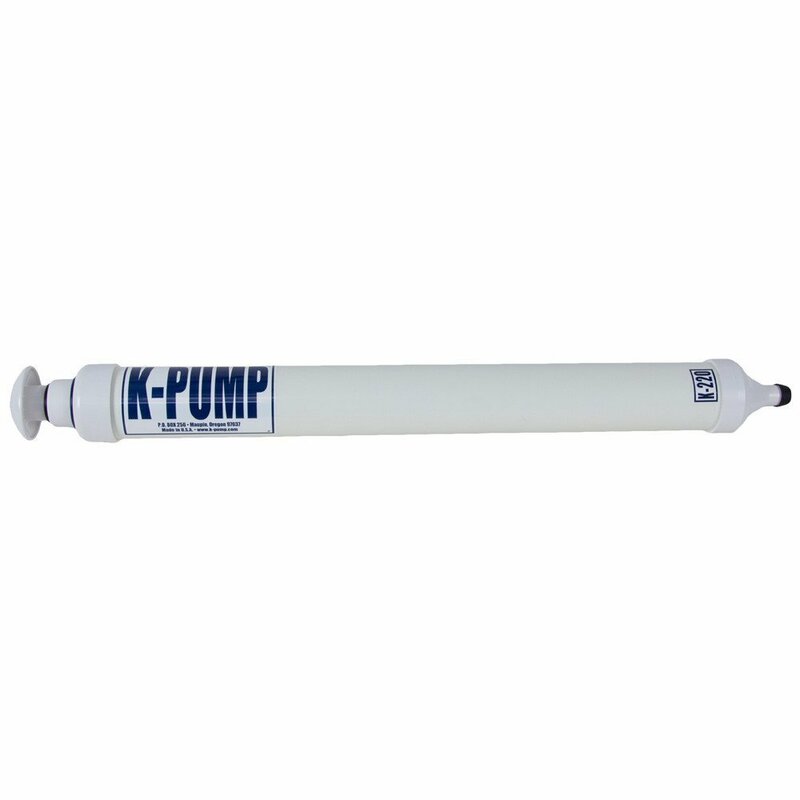 By far, the best bilge pump on the market today is this pump with float. It is lightweight, weighing only 1 pound. It comes with a float, so that if your kayak does tip you can access the pump quickly. It is a hand pump, which means you will not be pumping water out extremely fast, but it will get the job done and keep you safe. This pump is different for two reasons. 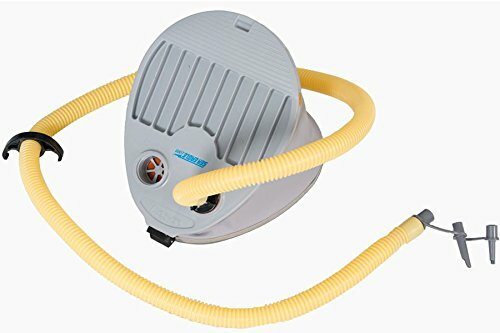 First, it is a hands-free pump which allows you to use your feet to pump the bellows. Second, this pump is heavier and large–which means that it can pump a lot more water than the Kayak Pump with Float. Kayak tow lines come in handy when you are out on the water. 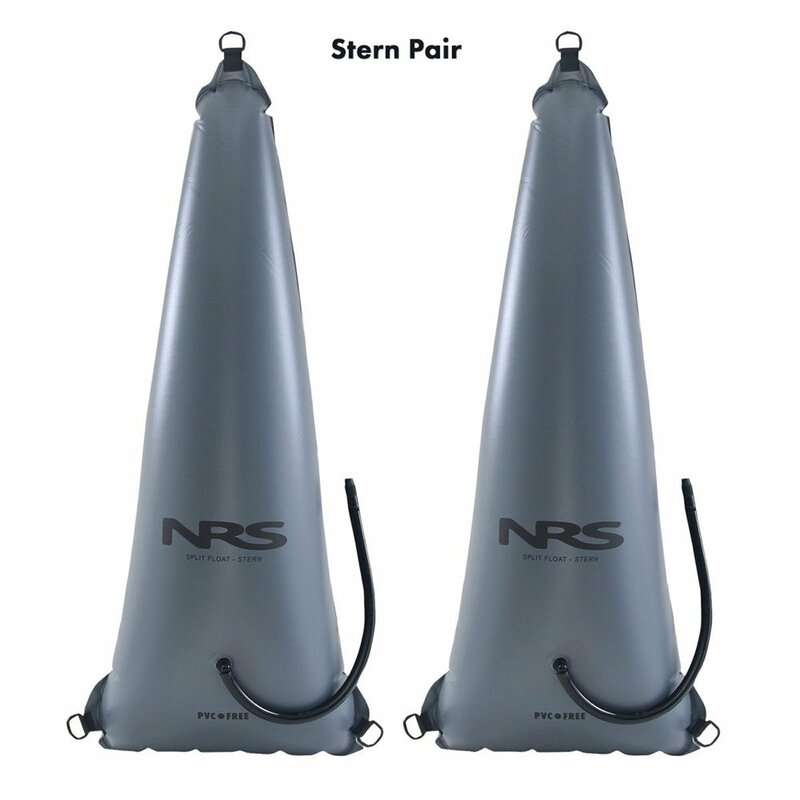 You can use them to stay attached to other kayaks, tow other kayaks, or tow gear behind you. 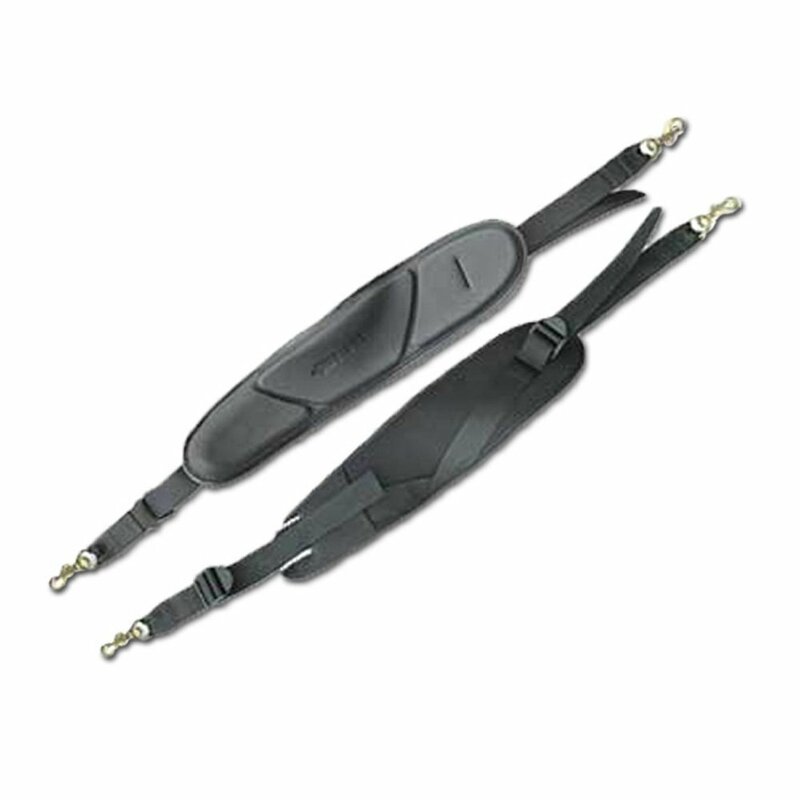 They come in a variety of forms, from belts which allow you to clip and unclip with ease, or full lines which attach to the back of your kayak. This throw bag designed by Scotty has 50 feet of line. This is a bag designed to allow you to throw it while holding on to one end of the line. Ultimately, you can use this to throw to a stranded kayaker or someone who has tipped their yak, and you can also use it to pull another kayak behind you. This line does not have clips, but they would be easy to add, if you do not add clips, you would have to tie knots with the line. 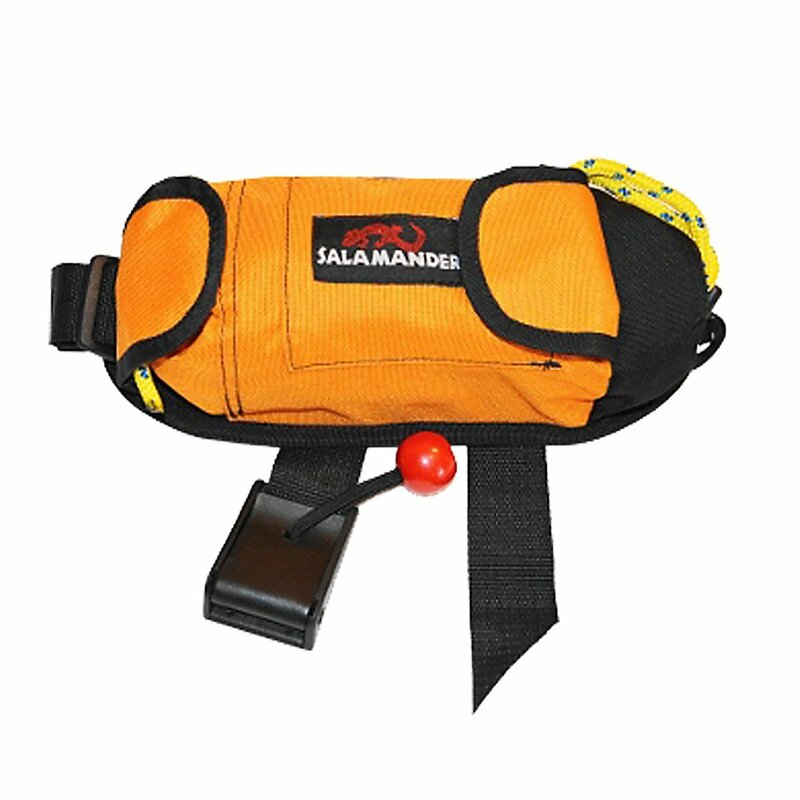 The Salamander Retriever Kayak Rescue Throw Rope Bag & Tow Tether is a full sized belt which you can wear when you are kayaking. 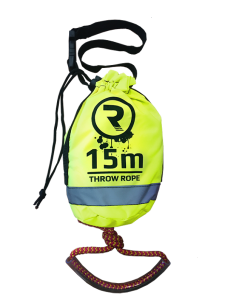 You can use the rope inside as a throw bag or a tow tether, and it does come with clips attached to either line. Kayak float bags are an extremely wise accessory to purchase. These little bags fit inside the bulkheads of your kayak. If you should tip, the water is displaced and the kayak stays more buoyant. This means that the kayak will be easier to right and it will be easier to empty the water. 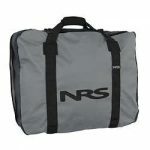 Easily the best kayak float bags on the market are these from NRS. They are perfect fitting for the majority of kayaks, though you will want to measure before purchasing. 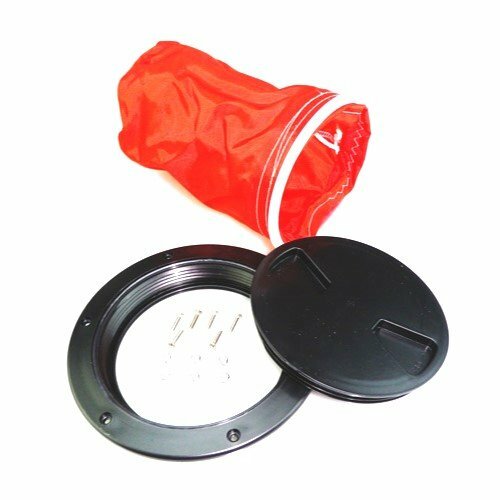 Another great feature of these float bags is that they are made out of 10 gauge urethane, which means they hold up extraordinarily well. 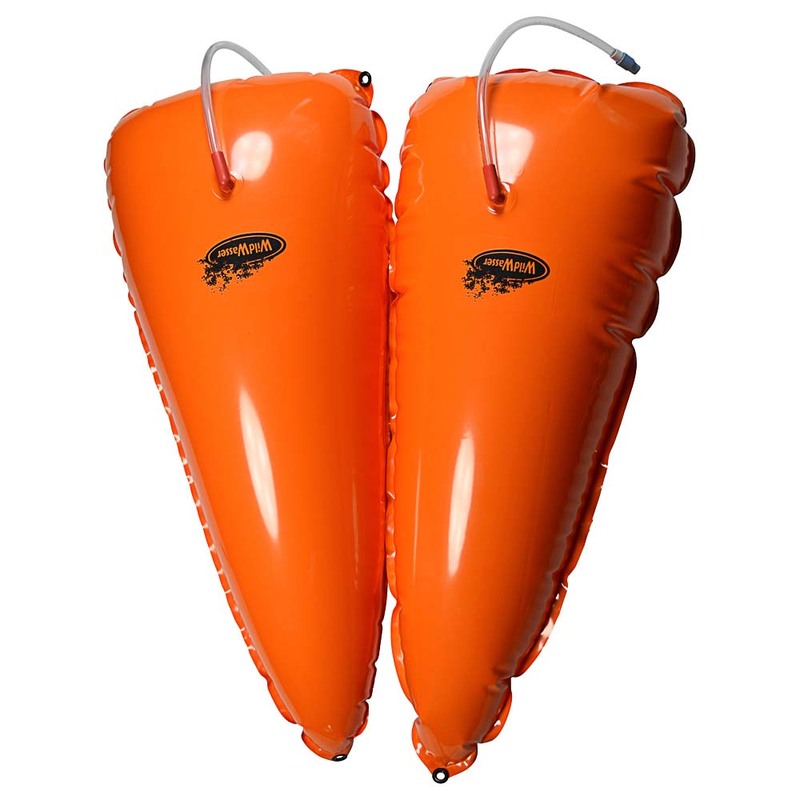 These float bags by Wildwasser are also some of the best float bags on the market. There are different fill sizes, which give you different dimensions. This means that many different kayakers can use these for varying kayaks–or if you own multiple kayaks, this is a wise purchase. There are three different places to tie these floats to your kayak, which allow you to ensure your kayak will be easier to flip if it tips. 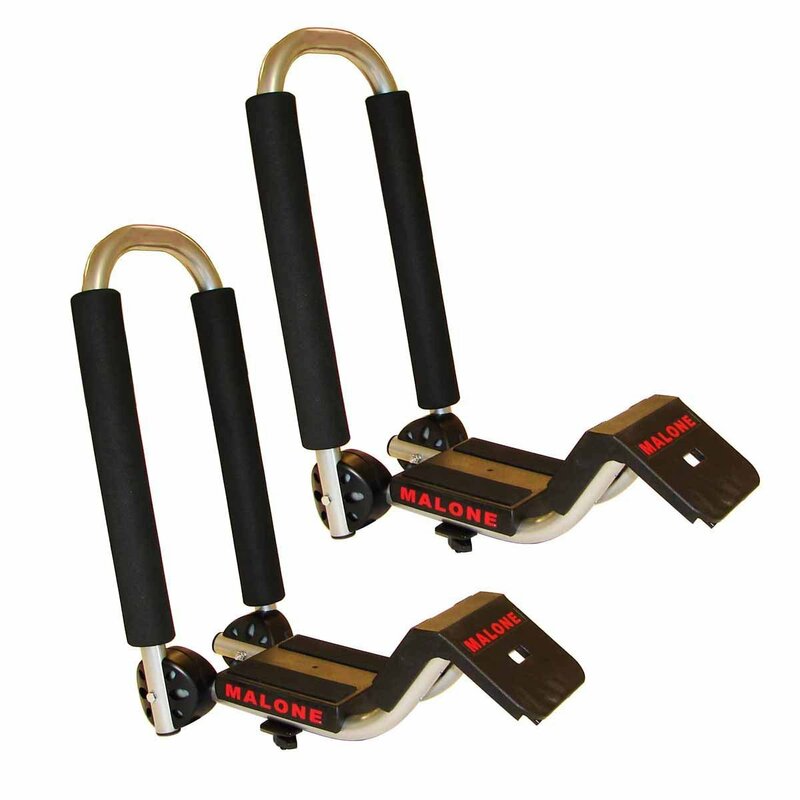 Anchor trolleys are a system which allows you to lower and raise your anchor with ease. 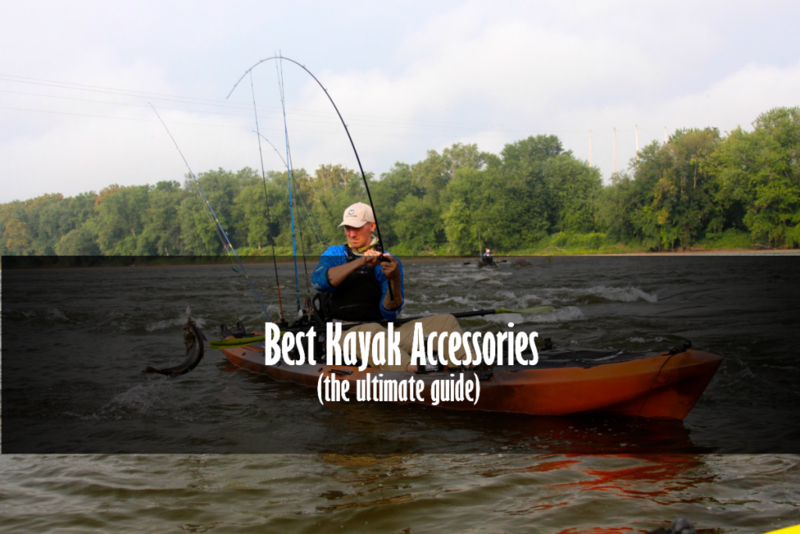 Some kayaks come with this system, especially top of the line fishing kayaks. However, if your kayak does not have an anchor trolley system, it is a great accessory to have, allowing you to go hands free in your yak. Like most Hobie products, this universal anchor trolley system is top of the line. It fits any kayaks, though it is ideal to use on a Hobie kayak. 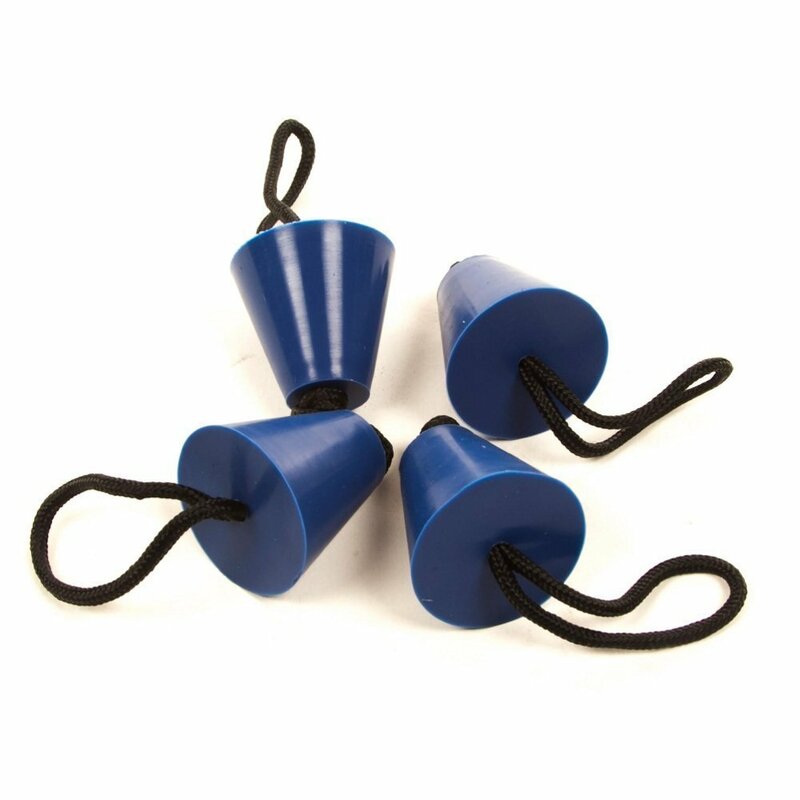 You can use it on either side of your yak, and you can trust that it is extremely easy to raise and lower. All of the parts are waterproof, so there should be no issues with rust, etc. This trolley system is only 30 feet in length. It is incredibly easy to install and easy to raise and lower. It may be wise to purchase a different rope if you want a longer rope or if you prefer a sturdy rope versus one with a lot of elasticity. Kayak foot braces are systems which give you something to brace your foot against. This is an excellent feature to include in your kayak, as it makes paddling much easier over time. That being said, sometimes these systems wear out or break and you will find yourself in need of a new foot brace system. 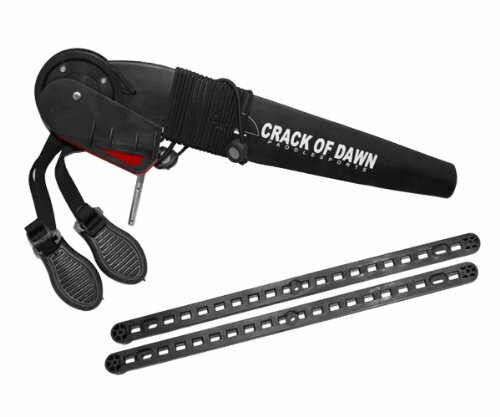 The Attwood 11940-2 is a 15 inch kayak foot brace, which fits most kayakers. If you know this is not adequate for you, look through their selection for a longer track. These are primarily metal, meaning they hold up extremely well in the long run. They do not come with equipment to mount them, so you will either have to purchase that additionally, or use a waterproofing glue to attach them to your kayak. Meanwhile, this foot brace system by Harmony keepers is lightweight and requires hardware to install properly. They are also a 15 inch system, so check that this is really accurate for you and your fellow kayakers. While the Attwood system was metal, this Harmony Keepers system is a combination of plastic rails and metal braces. Kayak rudders are often one of the most important pieces on the kayak. Many kayaks do not come equipped with them, but having one which you can remove if necessary is of utmost importance. Rudders allow you to steer your kayak more easily–this is even more important for kayaks with beams over 30 inches. This Nylon Glass Rudder hooks onto the stern of your kayak. It has a control line attached to it, which allows you to turn and twist it from the cockpit. It is also incredibly easy to lift out of the water in case you do not need the rudder. Meanwhile, the crack of dawn rudder kit is made primarily from plastic. It also comes with a steering line, allowing you to steer with your hands. 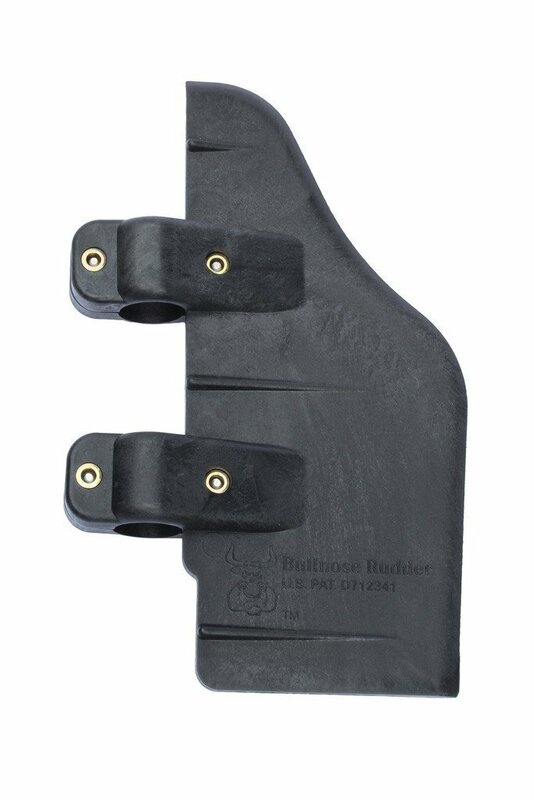 However, this kayak rudder can be set-up to use with foot pedals as well. This rudder is not as easy to unmount, so keep that in mind when considering this for your kayak rudder. Kayakers often argue over whether a skeg or rudder are best for kayaking. A rudder assists with steering, while a skeg helps you combat the waves you are facing. Skegs are more often used for ocean kayaks. This kayak skeg is made from PVC, making it extremely durable. However, unlike skegs which are on the kayak normally, this one is not retractable, but it is easy to take off of your kayak. Mounting Points’ skeg is incredibly durable. The Skeg built by MAYMII is also made out of PVC. You simply attach the skeg base to the bottom of the kayak with a waterproof glue and then attach the skeg when you want to use it. 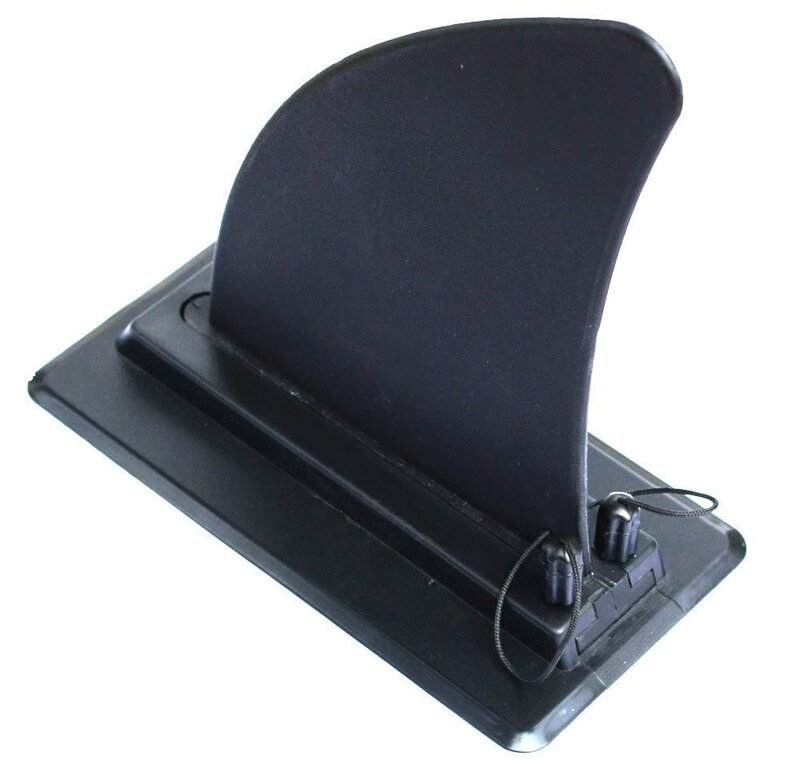 One note–for any skeg you purchase, you will want to make sure that the fin is the right length for your kayak. Scupper plugs allow you to plug your scupper holes on your kayak. This can be an important feature when the water begins to get cold in your area. These scupper plugs are universal, which means they fit many different kayaks. They come in four sizes, so make sure you measure your scupper holes before purchasing. They do hold up very well over time and are easy to remove, even mid-ride. Yak Gear is known for developing quite a bit of excellent accessories for kayaks. These do not have different sizes, but fit any scupper hole from ¾ inch to 1 ½ inches. Make sure these will fit your kayak scupper holes accurately. The plugs do hold up well over time. One type of kayak roof rack are saddles. Saddles form a u-shape and allow the kayak to rest in them. It typically requires two-four saddles for one kayak, and you can only haul one kayak per vehicle. That being said, this is a very stable type of roof rack for kayaks. 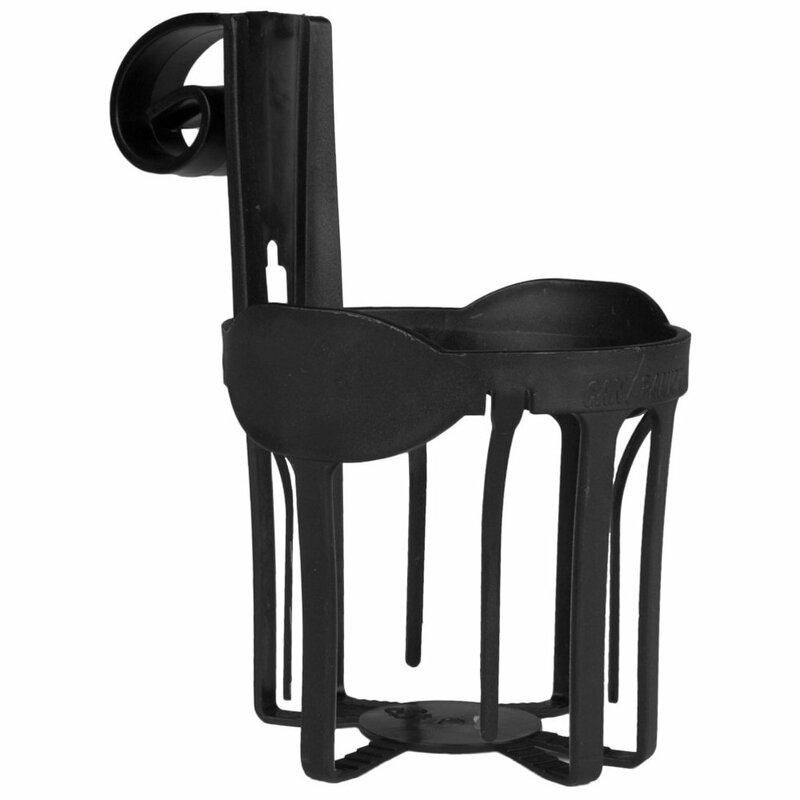 The saddles designed by Malone are made of a very heavy duty polycarbon and foam. 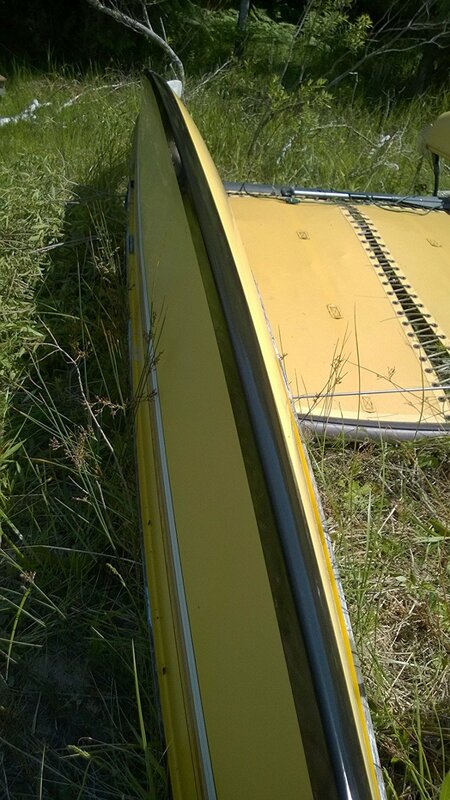 The foam merely supports the kayak and prevents the kayak from being injured by the frame. The brackets are stated to be universal, but if you have an issue with them fitting your car properly, simply call the company and they will fix the issue. Thule is known for their kayak roof racks. They are a superb roof rack company. This particular saddle requires four saddles to support the kayak. You can use two saddles for your yak, but it is not recommended. Keep in mind–this roof rack only carries up to 75 pounds. There are many backpacks designed for use in your kayak. This is because many kayakers camp overnight after a day of kayaking or carry a lot of equipment they want to keep close. Ideally, these backpacks will be fairly small and waterproof. 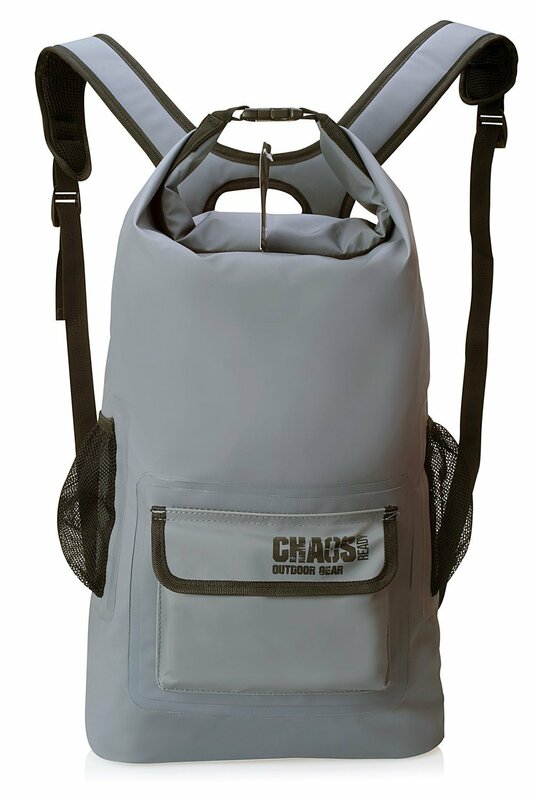 The waterproof backpack by Chaos Ready is made of PVC tarpaulin. It has two pockets: the large main pocket, and a small outer pocket. This backpack also has mesh on the sides for water bottles or small equipment. Though it is not intended for submersion, it is cleared for a quick dunk. 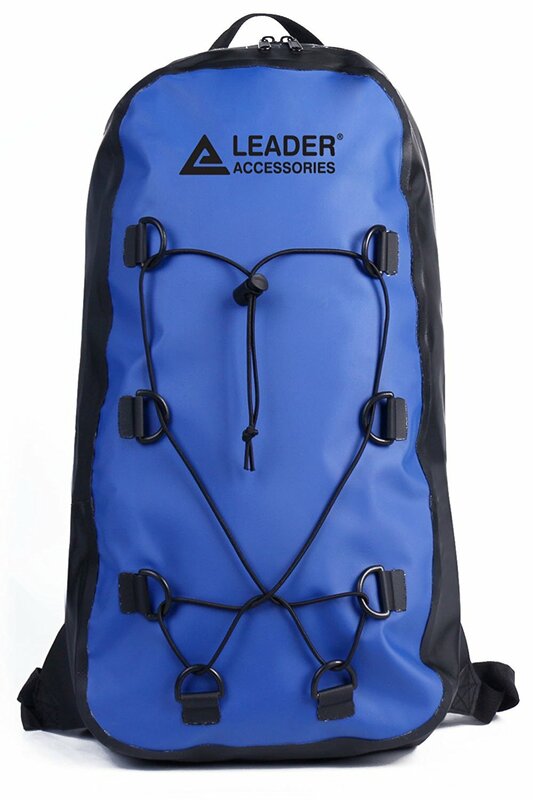 This backpack by Leader Accessories is slightly more heavy duty, but only one main pocket. This means there is no easy access to this backpack. However, this backpack has one major perk if you tip–it will actually float, meaning your gear will be completely protected. Kayak visibility kits allow you to apply either lights or reflective gear to your kayak. This allows other boats or kayaks to see you on the water. However, many of these kits do not hold up well to the wear and tear of being on a kayak day in and day out. 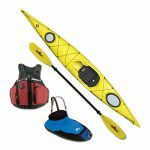 The two kayak kits listed below are known for their durability. The Railblaza kit is designed by Yakgear, which is notorious for creating excellent kayaking accessories. 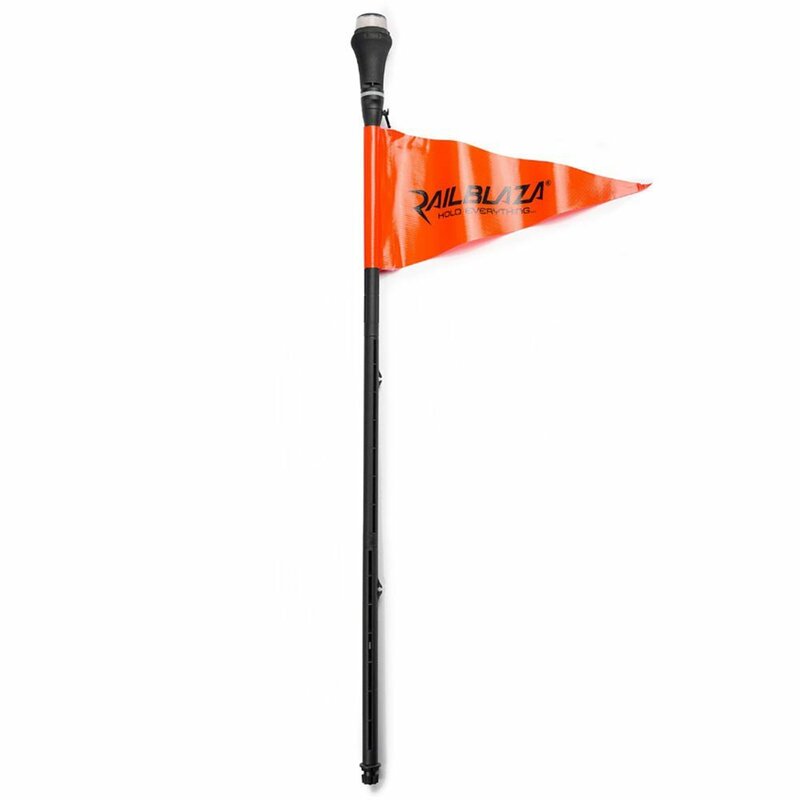 This kit includes a pole which can vary in size from 2 feet to 4 feet. It can hold a 360 degree light, a single beam, or a flag at the top. THe lights are battery powered and can last approximately 20 hours. If you are lost at night, this light will last you the entire time. 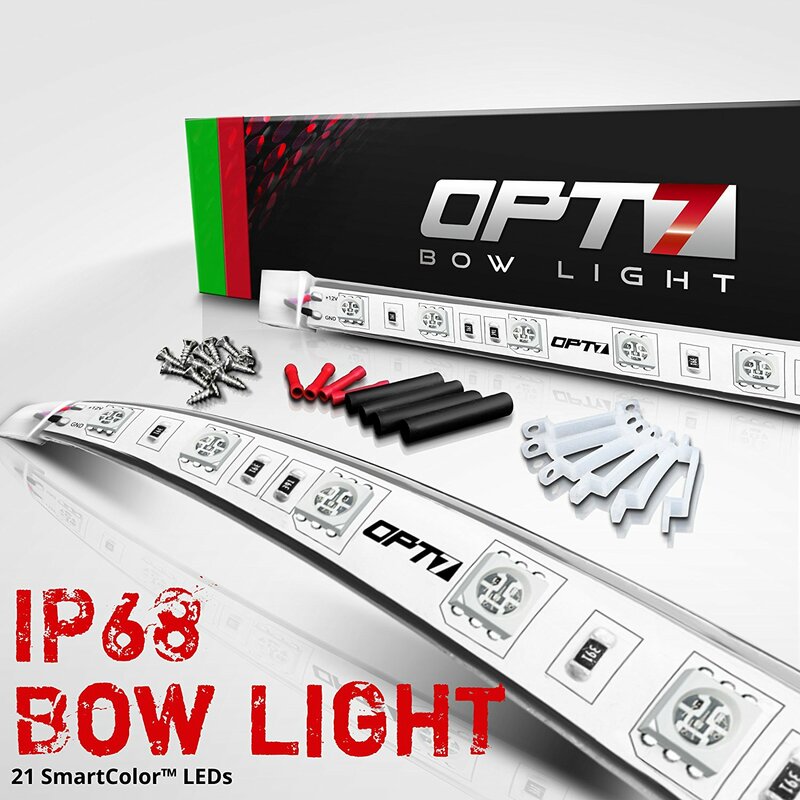 The Opt7 is a very different light kit. 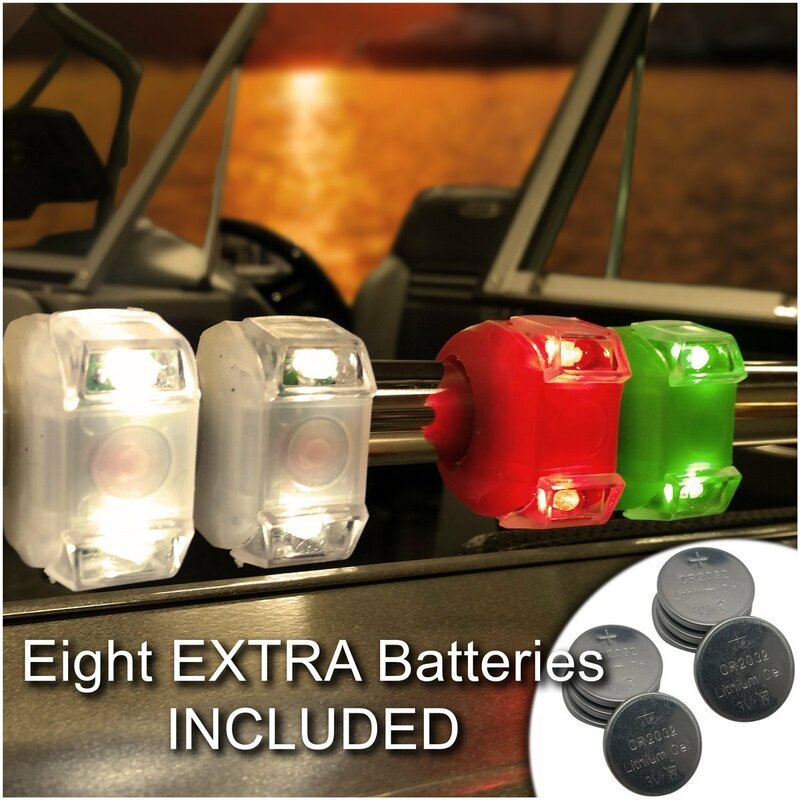 Instead of a pole light, this kit comes with strips which can adhere to the bow of your kayak. These lights are LED battery powered lights. They allow the kayak to be seen from 2 nautical miles away. Additionally, they are run on a battery, which you must keep in your kayak. It must be a 12V battery, which is similar to a trolling motor battery. Many kayaks have small hatches which are not waterproof. However, it is easy to make these hatches waterproof or simply give them a lid if you install a new hatch. Some of the best hatches are small, but waterproof. For most Ocean Kayaks, this Hatch kit locks on 6” storage compartments. It does not make them waterproof, but secures your belongings in the small hatch. You can feel confident that these hatches will not allow your belongings to drift away in case you tip. 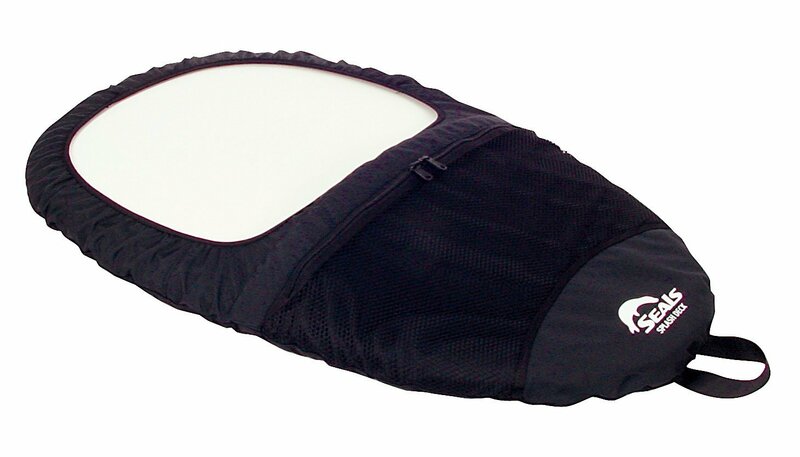 This kayak hatch can be used on any kayak. It requires an opening of 6 inches, but is only a 4 inch hatch. If you add silicone to it, it can quickly become a small waterproof hatch. It is very easy to install, although it requires some understanding of the hardware included. Thigh braces allow you to push against the side of the kayak which your thighs. 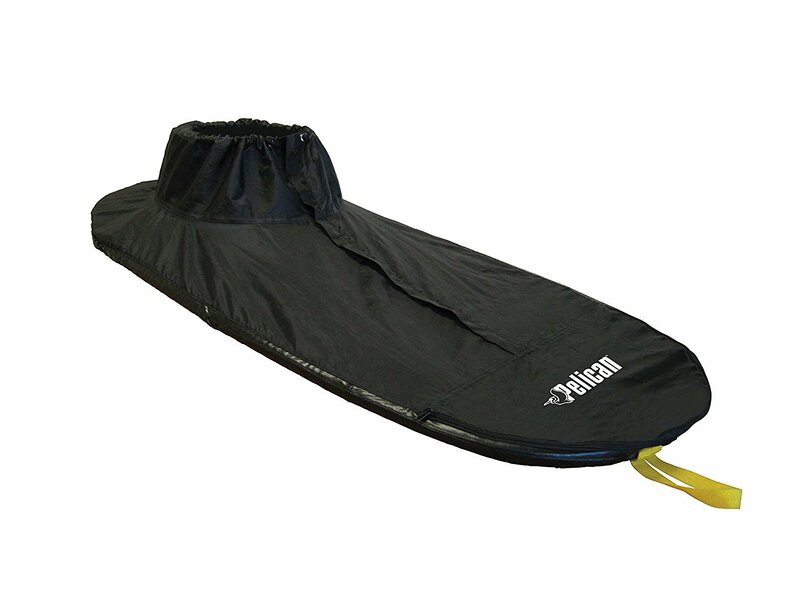 This gives you better support as you paddle and allows you to stay comfortable. Another use of thigh braces is for tall kayakers. On occasion, it can be more comfortable to bend your knees in the cockpit. Thigh braces give you a comfortable place to rest your legs as you kayak in this position. Thigh braces can also be straps which wrap around your thighs to help keep you secure. These thigh braces are adjustable, as they come with straps which allow you to tighten the thigh braces to the appropriate place for you. 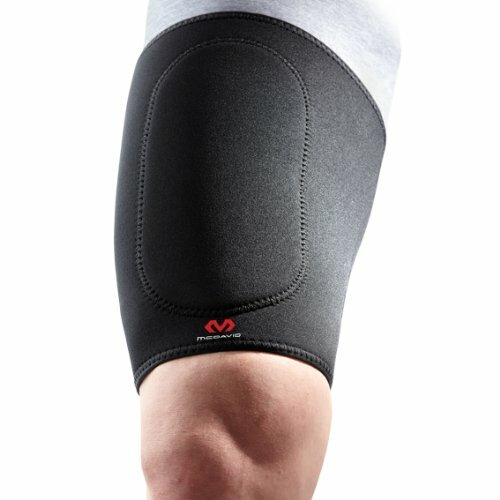 This thigh brace is designed with an in-knee pocket, in other words they wrap around your knee to keep you steady and give you more resistance as you paddle. These thigh braces are also thermal molded. They are also adjustable, although even more so than the previous thigh braces. These have straps to secure them, but those straps have many varying lengths. Additionally, this system is ergonomic, meaning it will not put any strain on your joints. Kayak Sprayskirt are pieces which seal over the cockpit of the kayak. They prevent any water from getting inside the yak. If you are a kayaker who is frequently encountering waves or a kayaker who prefers white water, a sprayskirt is absolutely necessary to keep you dry and safe. THese sprayskirts can keep you from tipping over. This spray skirt by Pelican is a universal XL spray skirt. Keep in mind, they offer different sizes of this skirt, so you do have multiple options. It connects to your cockpit with ease and features an easy zipper for entering and exiting. It meets your waist in a skin tight piece which seals you into your yak and prevents water from entering. The Seals Splash Deck is slightly different. It does not seal to your waist, but it allows water to hit the most open part of the kayak cockpit and pour of instead of entering. It has a very sturdy frame to it, allowing for a structure to it which encourage water run off. The softer covers, like the Pelican, can occasionally pool water on top. Some kayakers prefer kayak sails to be mounted on their kayaks. Not all kayakers prefer this. Kayak sails give the kayak more speed and ability to travel quickly by harnessing the wind. The best kayak sails will allow you to store them easily, be lightweight, but be made of a sturdy material to prevent tearing. Kayaking sails look a little different, unless you own a Hobie sail. These kayak sails are typically round, which may look odd, but it allows the sails to be stored more easily. With triple stitched seams, this 42 inch kayak sail is simply not going to fall apart on you easily. Additionally, because of its easy storage, it is also easy to set up and take down. Rest assured that this sail will help you get to where you need to go. The center part of this sail is clear plastic, which allows you to see through it and ensure that you can see precisely what is going on around you. 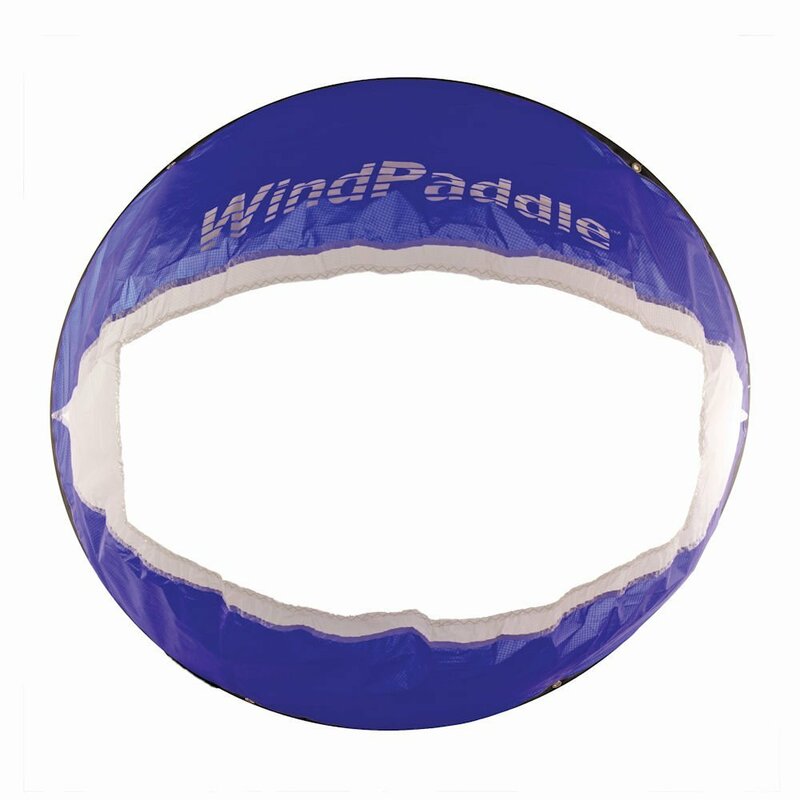 Like the Aunazz, this Windpaddle sail is entry level and is not meant to be used for high wind regions. It is recommended that this be used for kayaks of lengths between 8-15 feet. Keep in mind, due to this sail’s round shape, it is very easily stored. 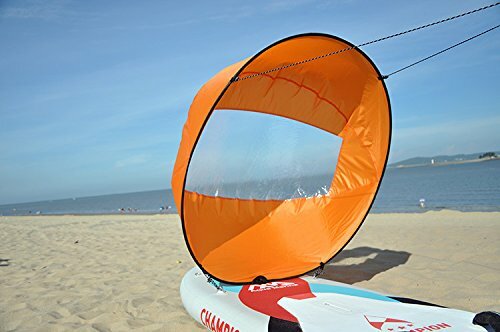 Also like the Aunazz, this Scout Sail allows for kayakers to be able to see down the center of the sail and know what is going on behind you. Lights can be incredibly crucial to have on your kayak. If you kayak when it is dark or close to dark, lights are often required legally. These lights are also important as they allow other boats to see you and you to see obstacles in the water more clearly. This set is strictly red and green lights. 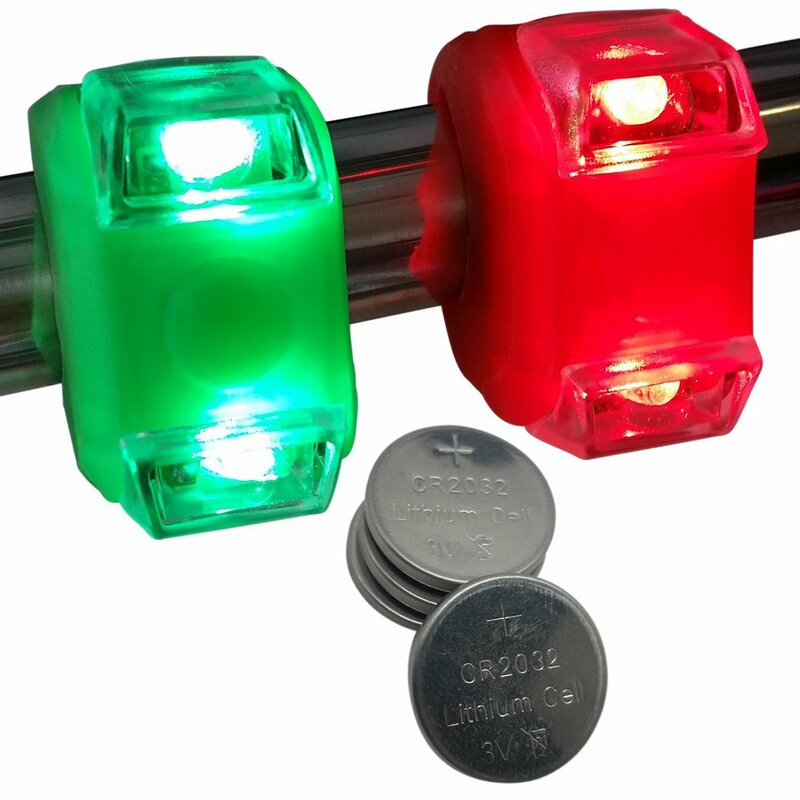 Red and green lights are known, traditionally, for signalling the various sides of the boat. This allows other boats to be able to see you and know where you are and where you are heading. These lights will not help you see in the light and are only meant for safety signally. This second set by Bright Eyes also includes emergency white lights. There are two of the white lights and then one red light and one green light. Remember–these red and green lights signal the various sides of the kayak and then signal how you are moving through the water. Keel Guards are designed to adhere to the keel of your kayak. Once they are adhered, they guarantee that the keel will not leak water. This is of utmost importance, as many kayaks will leak water at the seams. Ultimately, the main company which produces keel guards is Pereguard. They have designed a series of keel guard, varying from 5 feet to 18 feet. As 10 feet is a more average length, that is the guard which will be reviewed below. The guards designed by Pereguard work only on thermo, fiberglass, and roto boat kayaks. It creates a tight seal, ensuring waterproofing. However, it additionally provides an incredibly smooth surface. This smooth surface reduces friction between the boat and the water, allowing kayakers to reach higher speeds. Safety D Rings are a d-shaped ring. When attached to the side of your kayak, you are able to hook equipment to them. This means that if your kayak should tip, you are guaranteed that your gear will not be separated from your kayak. This D-ring set comes as 10 individual D rings. You can fit these d-rings on your kayak wherever you please–such a large kit allows you to have many places to secure your equipment. Additioanlly, these D rings are made lightweight, but sturdy. 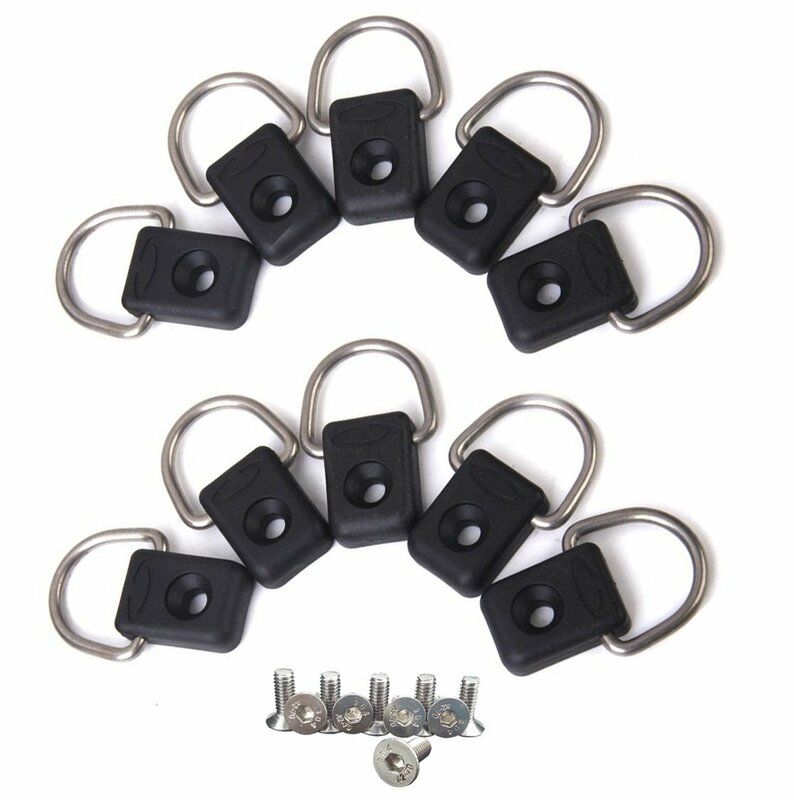 You can use these d rings to secure paddle leashes and other equipment. Make sure the D rings are the size you need before you order them. Many white water kayakers like to record their experience. Some kayaker put a GoPro on their helmet to record the experience, but it may be your preference to secure it on your boat. Using a camera pole for your GoPro allows you to mount your GoPro safely and securely on your boat. 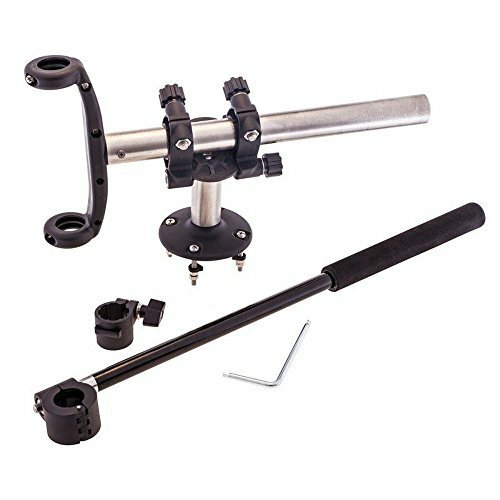 If you are looking for simple, the YakAttack camera pole is perfect for you. This pole mounts on any sort of track system. It is 28 inches tall and supports a 1 inch GoPro ball. 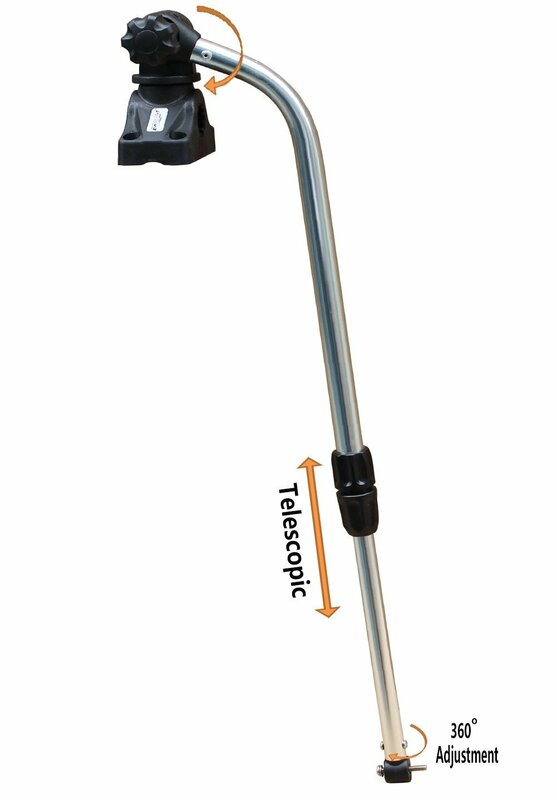 Take note–including the pole, the camera should not weigh more than 1 pound. If it does, you risk the pole tipping or breaking. Another mount, by BroCraft, is not as simple as the YakAttack mount. The BroCraft can mount on your deck or the side of the kayak. It does not require the track system to mount. Additionally, it can adjust up to 9 inches in height. Finally, the mount is 360 degrees, which means that you can capture all of your surroundings while kayaking. Most people kayak with their cell phone. Their cell phone allows them to check in with their friends and family and stay safe while kayaking. The phones can also ensure that you can check in with your job or snap a picture of your beautiful surroundings. However, the idea of tipping your kayak with a $600 iPhone in hand is terrifying. 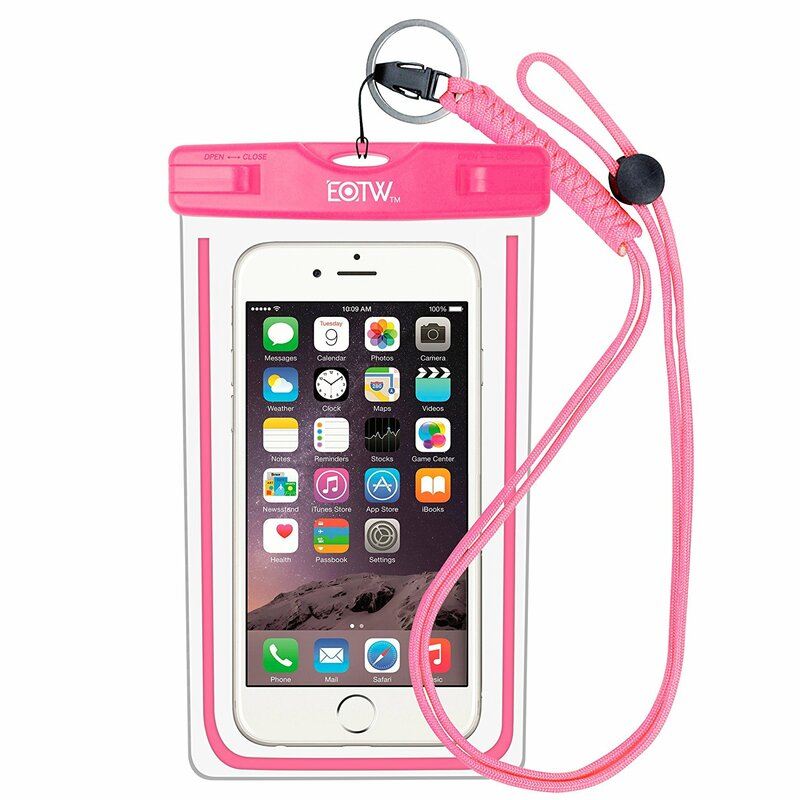 It is crucial to purchase the best dry bag for cell phones to keep your phone safe. This phone case fits any phone measuring 6.3 inches in length. Additionally, you can take pictures through the case, which means it is fairly functional, even with the covering. Your phone can be submerged up to 100 feet Finally, this case can be replaced anytime in 5 years, with absolutely no hassle. 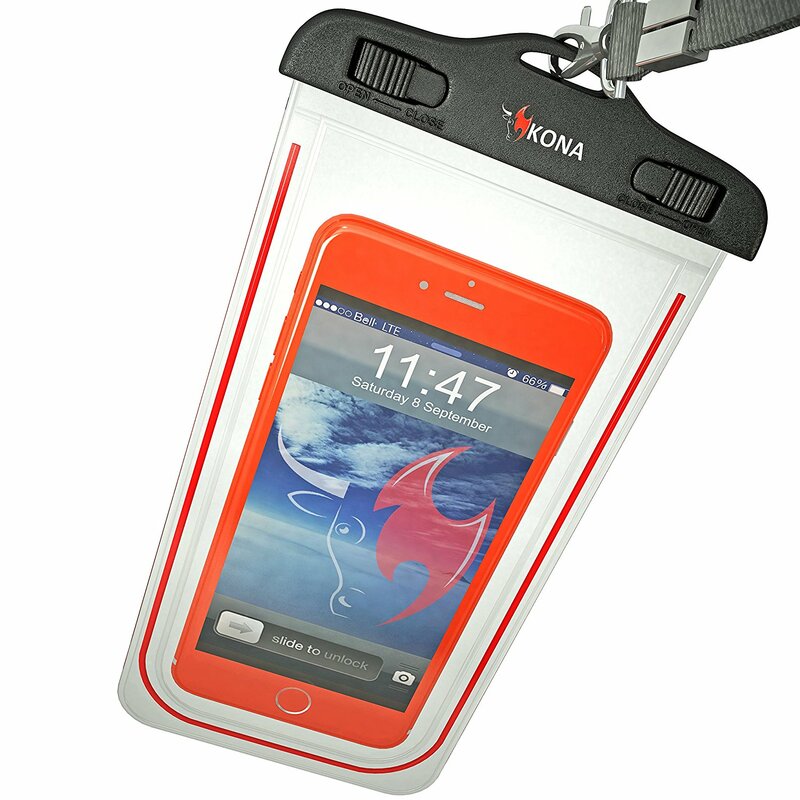 This case is very similar to the Submariner II Waterproof phone case, but it comes with a lanyard already attached. This lanyard makes it very easy for you to keep your phone safe and close by while you are kayaking. Any phone should fit well, and you should be able to use the phone, just like normal while it is in this protective case. Winter rolls around and you suddenly realize you don’t want your kayak leaning against the outside of your house anymore. By purchasing a kayak wall mount, you can easily store your kayaks inside your garage or on the wall of your storage area. 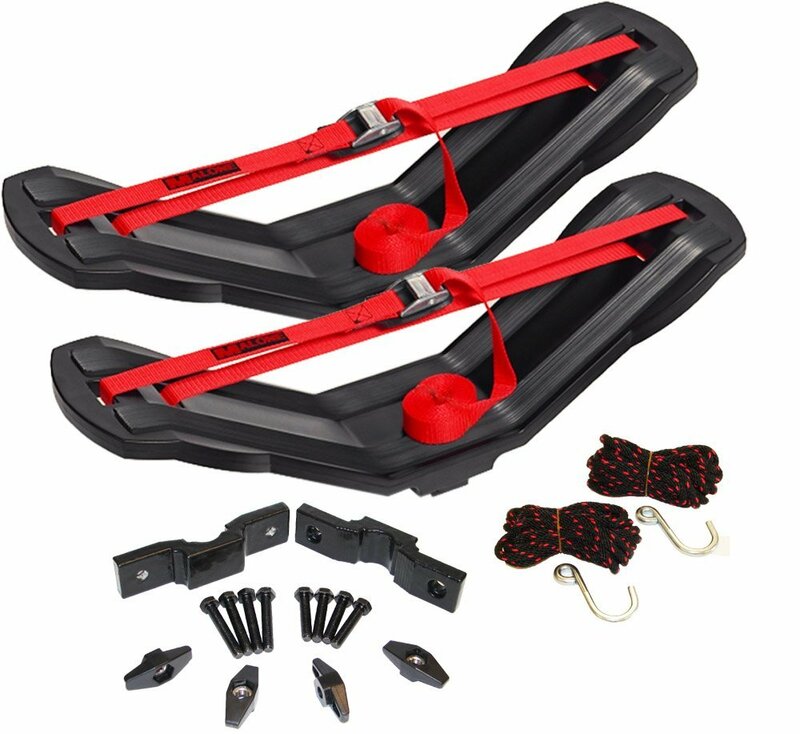 This guarantees that you will keep your kayaks safe from the difficulty of winter weather. These cradles measure 24 inches by 14 inches. They are incredibly easy to mount, as well and come with all of the hardware necessary to get the job done. Additionally, they can hold any size kayak. Be cautious mounting these on an exterior wall which gets extremely cold–your cradles can be damaged. These cradles are very different, as they are steel and covered in foam. The steel makes them much more sturdy than the Seattle Sports, and the foam ensures that the kayak will be protected. They can be hung at any distance, but only extend 21 inches from the wall. Additionally, they will only hold 100 pounds of kayak. 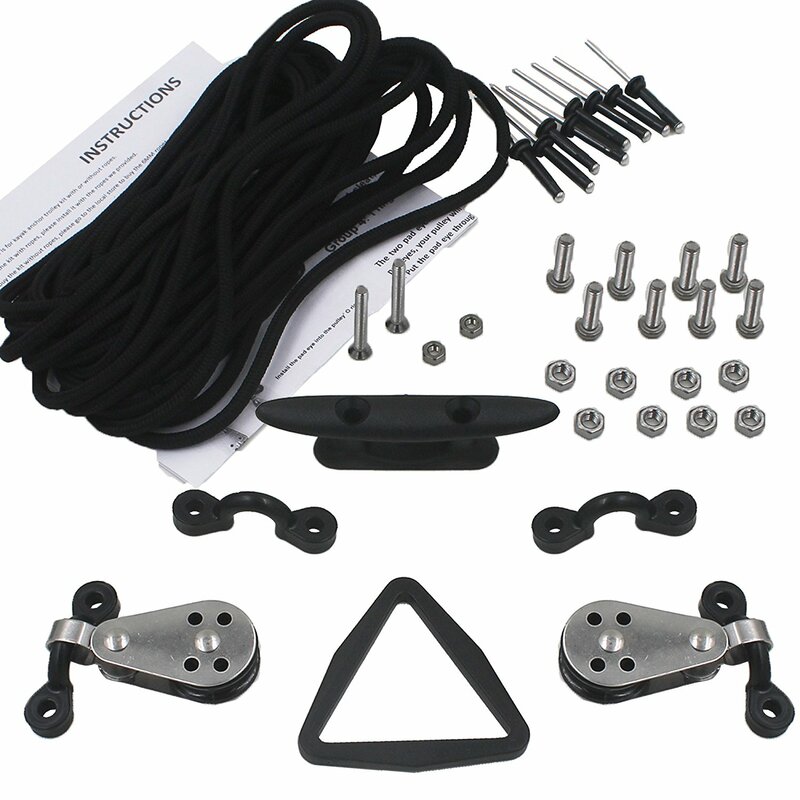 Many motor mounts for kayaks are designed specifically for the brand of kayak you have. This ensures that your motor will fit well based on the size of the kayak’s cockpit or hull. Keep this in mind as you are shopping for your motor mount. This being said, some of the best kayak mounts reduce the vibrations felt while the motor is running. 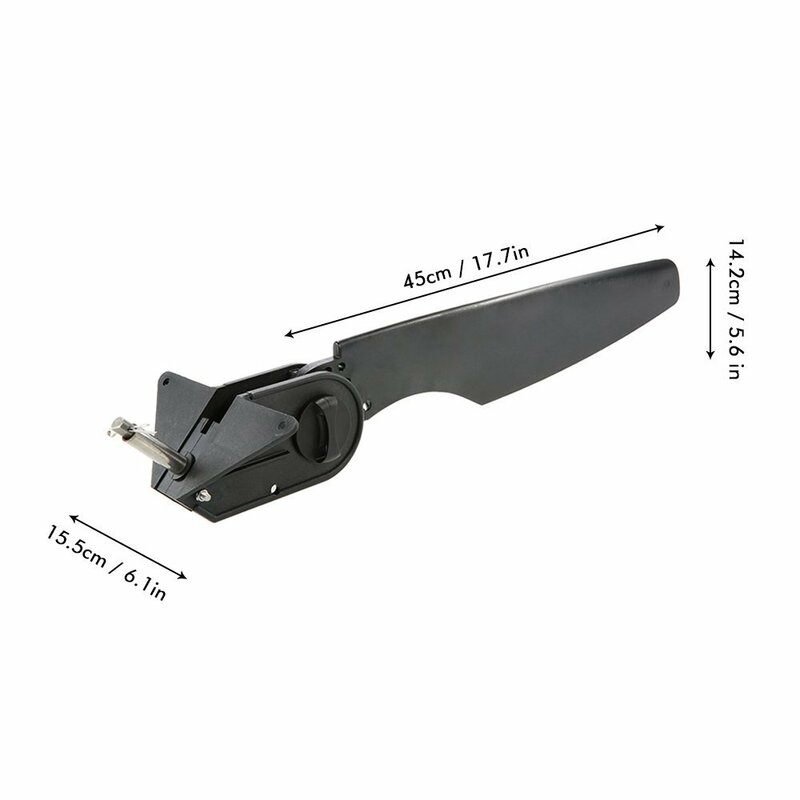 This motor mount by Watersnake allows you to mount your motor on the outside edge of the kayak. Mounting this way can make it a little tricky to steer, but for most it is easy to adjust to this change. Additionally, by mounting the motor this way, it keeps vibrations down on the kayak. This motor mount by Brocraft is designed for trolling motors. These motors sit on the back of the kayak and can adjust for all different kayak sizes. Additionally, the angles of the mount can fit many different kayak sides. ALl of the hardware is rust resistant, as well, protecting your kayak gear. Kayak Transducers are not well-known kayak accessories, but they are very important to have and use. Transducers are sonar systems which identify fish in the water and report this back to the kayaker. When you are using a transducer it is crucial to have them mounted. This transducer is waterproof and handheld. This means that you can keep it close to see exactly where the fish are–and check often. It can even use the temperature of the water to tell you precisely where fish are. 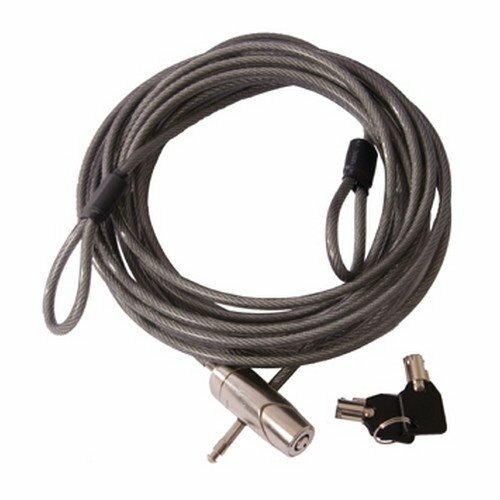 This is a major perk and makes this one of the best kayak transducers on the market. This is an especially excellent transducer, as it has a built-in GPS as well. As it is waterproof, has a keypad, and can be mounted, this transducer is everything that the Portable is not. 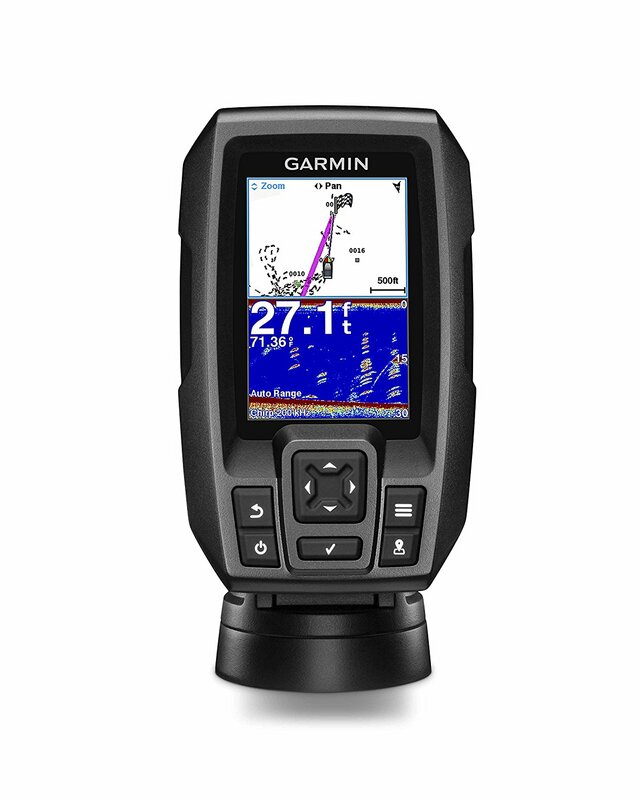 Complex and challenging, but efficient and sleek, this model by Garmin will help you reach the fish easily. Mounting your transducer allows it to be hands free–you can watch it as you paddle or cast, but you do not have to hold on to it as you engage in your favorite kayaking activity. 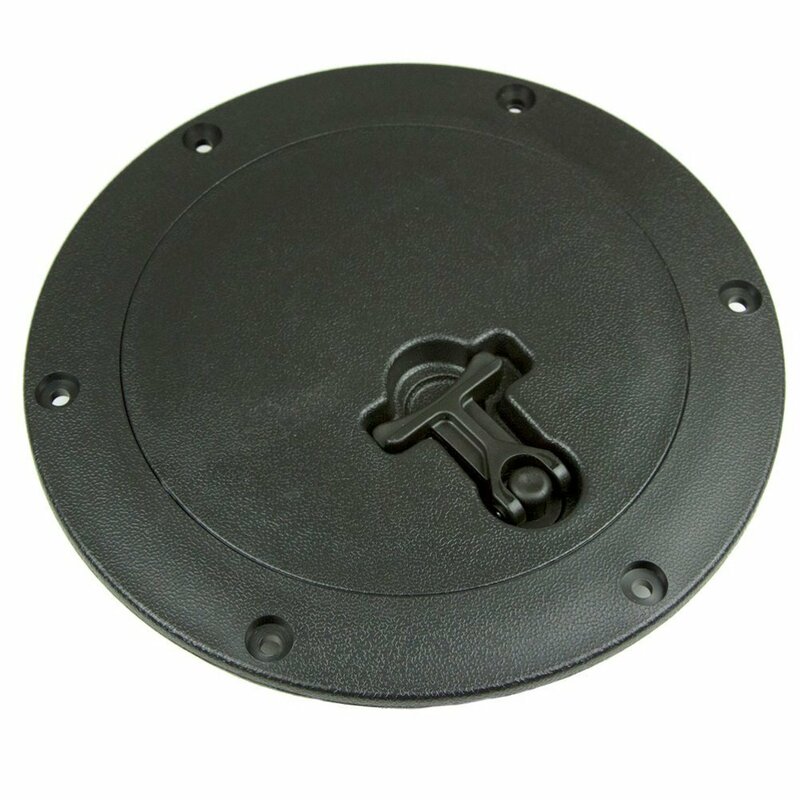 Mounting a transducer should be easy, so check out the following mounts! This transducer mount can dip quickly and easily into the water and be lifted right back out again. Although there are some reports that the bar is not shaped properly, most argue that it can be flexed back into position with ease. It is rare to find a mount which is so easy to mount and unmount, and equally easy to rotate out from over the water’s edge. This is an aluminum arm which rotates a full 360 degrees. It also can adjust from 17 inches to 25 inches and is completely waterproof. This Transducer mount by Brocraft is slightly more user friendly than the RAM mount. Many kayakers need straps to attach the kayak to their roof racks. 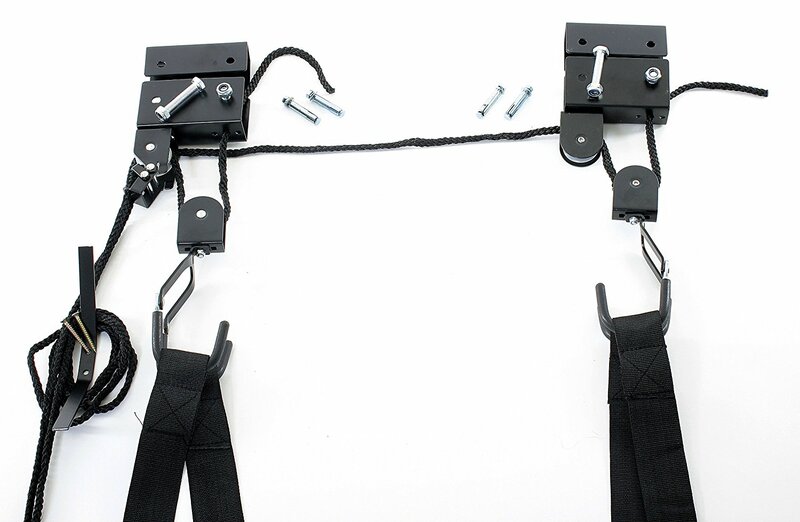 They may also need the straps for a kayak cart or for securing the kayak to their wall mount. As the straps will probably be used for many different jobs, it is best to invest in an extremely solid pair of straps. 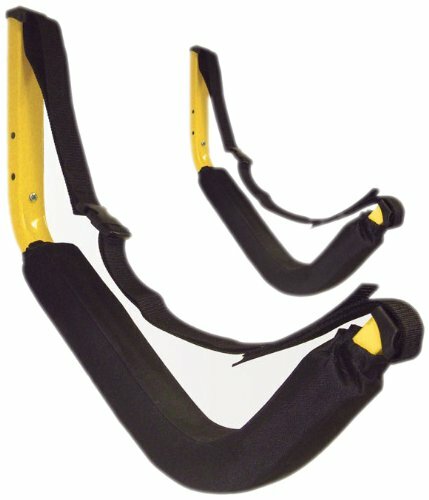 These kayak straps designed by Cartman measure one inch by 12 feet. 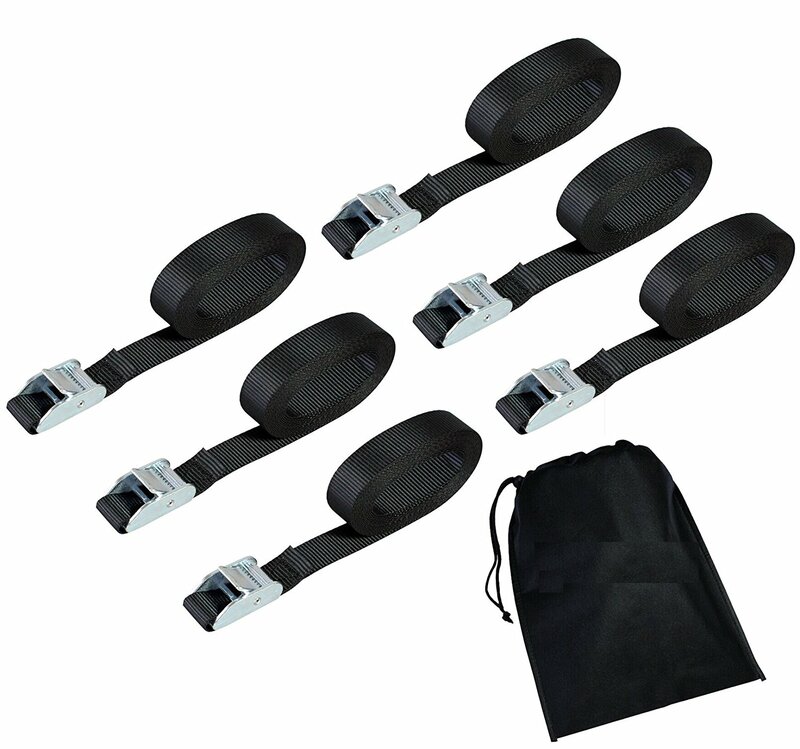 They can each hold up to 600 pounds, which means any kayak will be secure because of these straps. Additionally, they come in a carry bag and six of them will arrive at your doorstep. Most kayakers only use 2 straps at a time, so this means you will have multiple back up straps for your yak. These straps from Yakima are only a set of two. That being said, they measure 16 feet. The straps are heavy duty and it is very difficult to damage these straps. 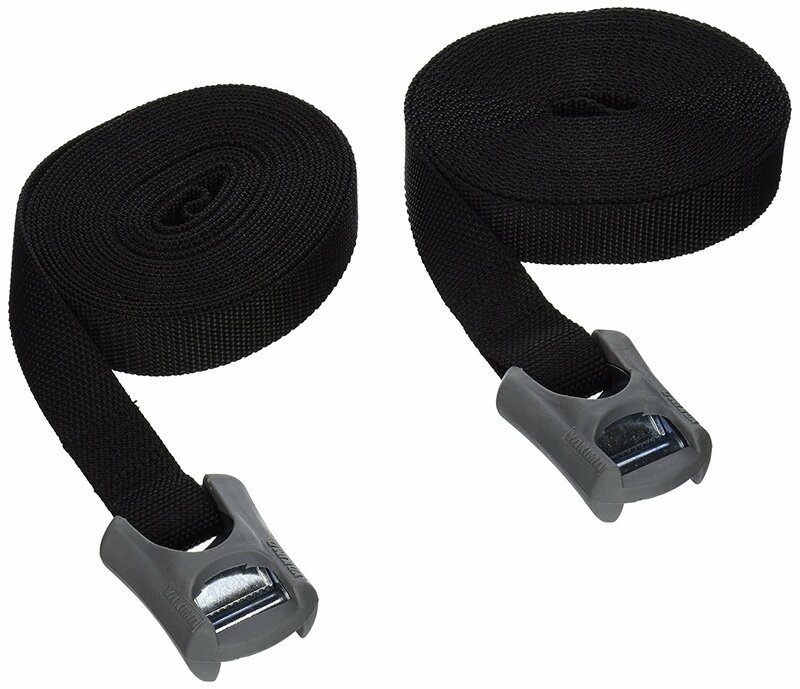 Rest assured that these kayak straps will hold up for a long period of time for you. Kayak hoists can serve several purposes. You can use a kayak hoist to store your kayak in your garage. You can also use a kayak hoist to move your kayak, with ease, on top of your vehicle for traveling. A kayak hoist is just what is sounds–it is a series of pulleys and straps which allow you to hoist your kayak up into the air. This kayak hoist by Rad Sportz can hold up to 125 pounds of gear. This means that your kayak is almost guaranteed to be safely held. Additionally, they have a very sturdy pulley system. The hoist can work on ceilings up to 12 feet high, meaning that the kayak can be hoisted almost that high in the air. This allows for storage in almost any garage. 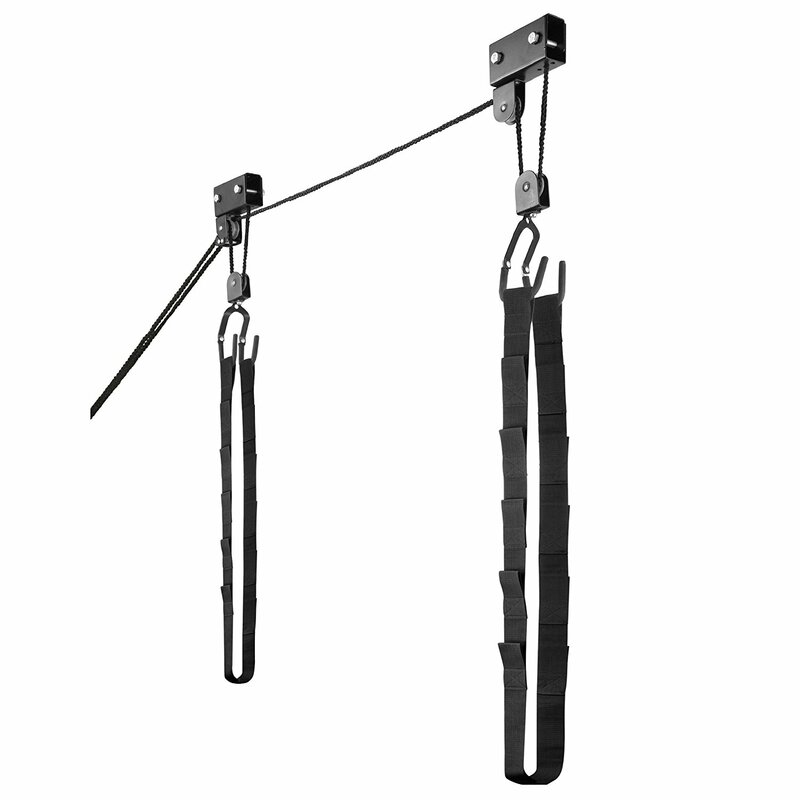 Similar to the kayak hoist by Rad Sportz, the hoist by ProSource can also hold 125 pounds. This system pays a little more attention to detail. The hooks connecting the straps to the pulley system are coated in rubber, protecting the kayak. Additionally, it can still be used on ceilings up to 12 feet in height. There are many kayak accessories you could use in your kayak. You could mount a transducer or a trolling motor or a GoPro. You could wear a helmet for river kayaking or wear a backpack for overnight kayaking trips. The sky is the limit when it comes to enjoying your kayak and the activities which come along with it. When you choose your favorite kayak accessories to buy, make sure you do your research and purchase precisely the ones that are perfect for your kayaking needs! Jeff, thank you for sharing. We will consider adding it to our long list of kayak accessories!